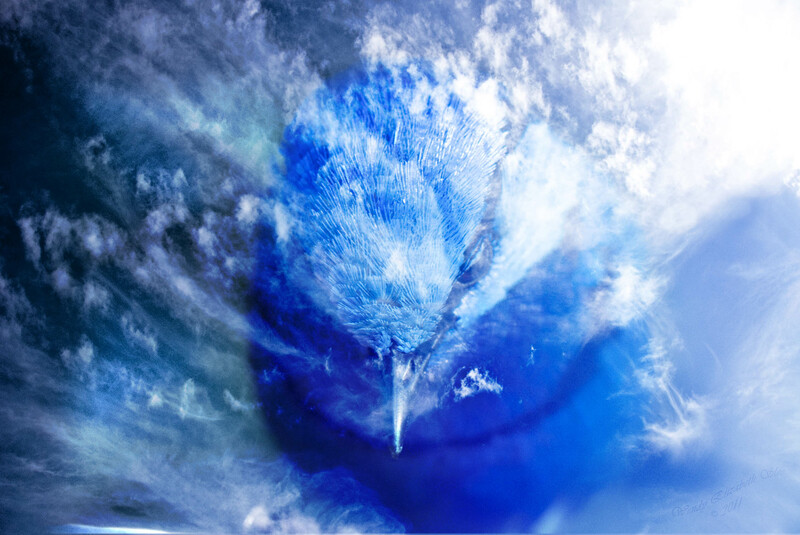 And pieces of blue fall to the earth. He sings right up to the last moment. Because for him, the moment is all there is. It is immediate, it is present, it is now. It is the breath upon your lips, the very life blood in your veins and the beat of your heart. He opens his heart and channels his very soul out into the world. That’s what blue birds do. They give of their joy, without limitation, without fear, without expectation. They just open up their hearts and immerse everything around them in pure celebration of the moment. And lets the blue within me fly free. 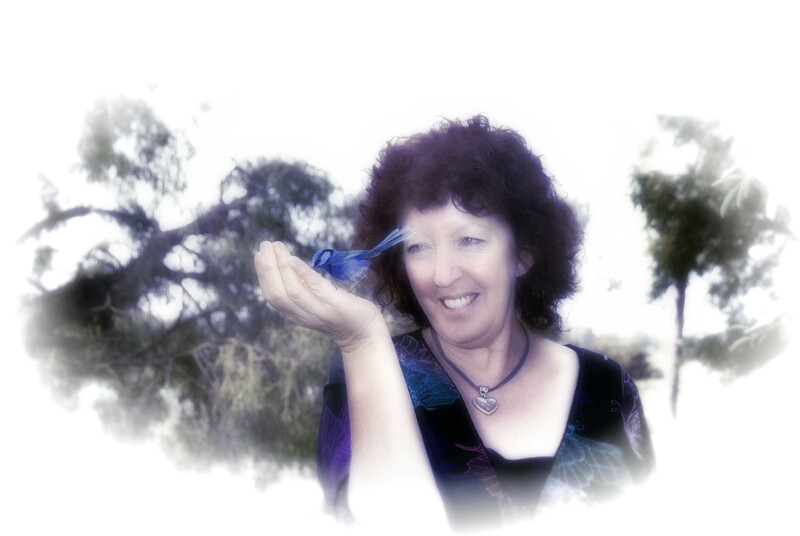 When you stand close to a blue bird who is performing such a ritual, you can feel it – the vibrations of the song, and the energy that gives it such power, reverberates through you, and you cannot fail to be moved in some way, great or small. You feel that song, that melody, that joy, push through you and light up your cells. It is a celebration. You resonate! 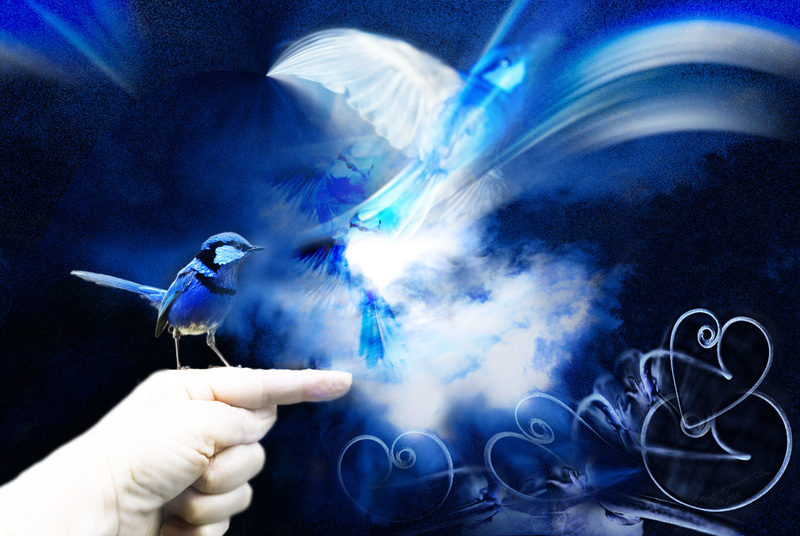 That is the magic of the blue birds. They lift vibrations, they sing frequencies that touch and heal and weave magic. It is a public display of life, of the pure, sweet being in the moment. It is a reminder to each of us. It is sweet, and sacred, and loud and undeniable. Listen! Feel! Be! With new colours to paint the world. Yet there is more, so much more. There is the moment tiny claws connect and wrap around your fingers, and something passes between you, something deeper than trust, something that you share with all life, but have long since forgotten. So you awaken just a little more. Then you have the moment when across and open field a wild bird flies straight at you, with the sole intent of connecting, and landing on or near your person, then hops merrily up your arm to your shoulder, just to get a little closer. There is humour, there is mischief, there is life. You look in that bright eye, that misses nothing, the head cocked first one way, then another, and even more passes between you – a connection as ancient as life itself…. A recognition of shared existence and mutual honour for the Earth Mother who gave birth to us all. 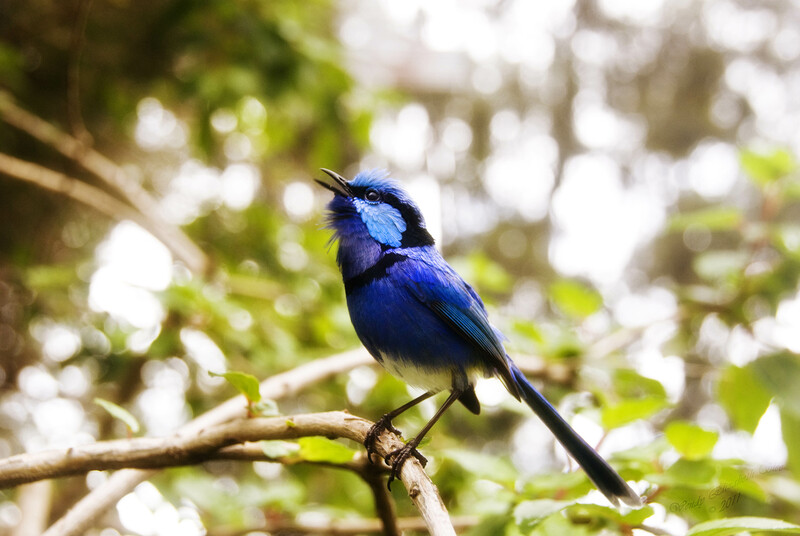 I always believed the winged ones were messengers, and this little blue bird, he came looking for me. He had a message for me, a message he asked me to share with the world. It just took me a while to “get it”. I thought he was a gift, too amazing to be real, and at times, my fear of loss kept me stumbling around, even as I learned the only way to receive the gifts of the universe, is with an open hand, so they can fly freely. And when I let go of any need to own or hold onto, he truly blessed me with wings of my own, so I could share the flight. He showed me how to deal with loss a few weeks ago, and to let go of my fear. In bundle of little blue feathers, that had my heart scrabbling with pain, at first for him, and then, when he flew up to show me he was still there, for sadness at the anonymous little blue person who had died, he taught me that endings were always a part of the song, but only so a new melody could begin. He delivered to me the lesson of cycles, of beginnings and endings, and the pure free flight between. He gifted me an ongoing joy into my garden, both the literal one, and the true one within my soul. He also came to say goodbye. At first I laughed at my strange dream on Tuesday morning. And wanted to forget and not share it. 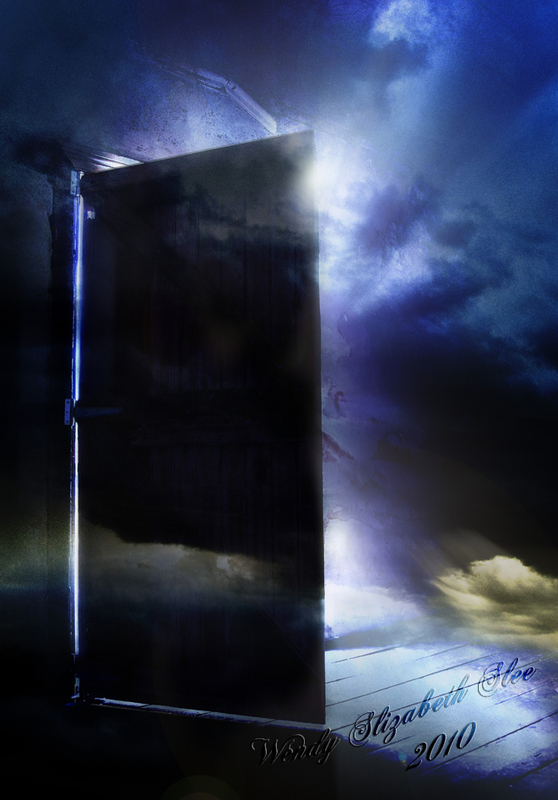 But it was one of the prophetic dreams I have and recognize from time to time. It unsettled me, and it’s message stayed, gaining depth and power instead of ebbing away. It was a message of love. 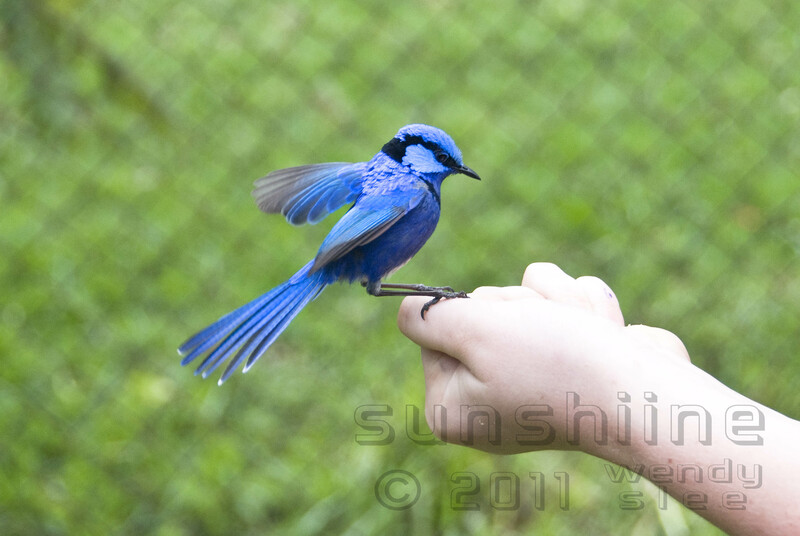 This little blue bird, he sat with me and the message passed between us. “I see you” he said wordlessly. “I see you” my heart shared back to him. Then he rubbed the top of his head back and forth on my lips, like a beloved pet would rub your hand or leg, the most unusual kiss of a soulmate. I awoke thinking “how bizarre”. But could not escape the surge of unconditional love that was all around me from that moment, and the awareness of which has remained firmly with me every since. And I went out to face the day – a day where he was absent. And then the next day – he was still missing. 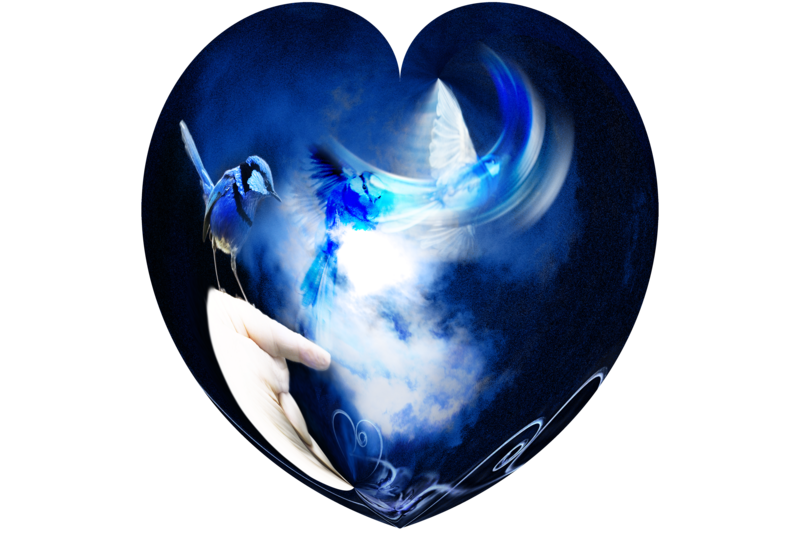 And then the profound realization, that the dream had been a goodbye from my little friend, because this little blue bird has disappeared and now exists only in my heart, my dreams and my images. Today they go on as if nothing has changed. The landscape is full of life, and yet it has a hole in it. My heart feels heavy because I know that something is missing. There are other wrens alive and well singing in the trees around my home. There is a family still there and a little blue son to keep the songline unbroken. 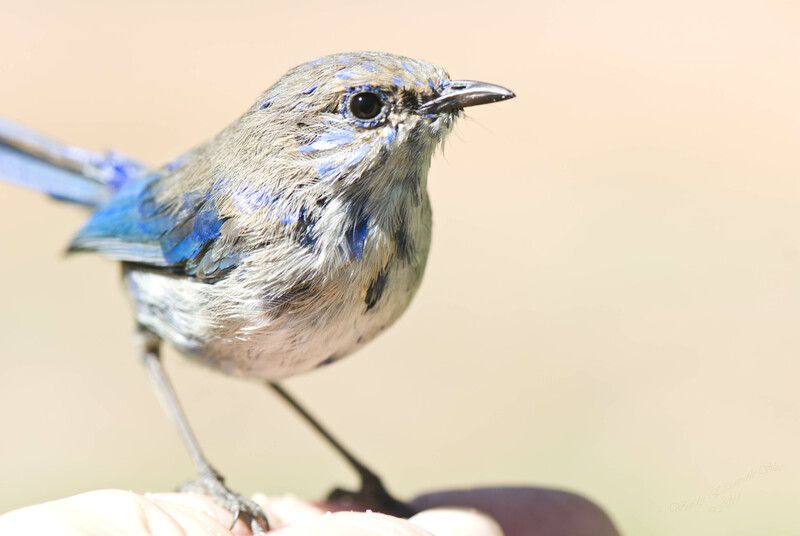 How do blue wrens grieve? No matter what happens, what loss they suffer, they just pick up the pieces of their life and rebuild their broken nest, go on with their day to day duties, and all the while, they sing. Most of all – they SING! They sing like there is no tomorrow and this very moment is the most joyful gift to be shared with the world. They do not weep but declare their joy at being alive. They pick up the pieces of a melody and stitch them together in a new way…. And … They sing. If we could only sing like that when our hearts were broken! AS the days pass, I watch little Henny frantically rebuild her nest and her life, while nurturing her juvenile son on her own. I wished there was more I could do to protect and assist her, but alas, within days, she too, tragically disappeared, with only a few feathers and a small broken blue egg left on the ground. 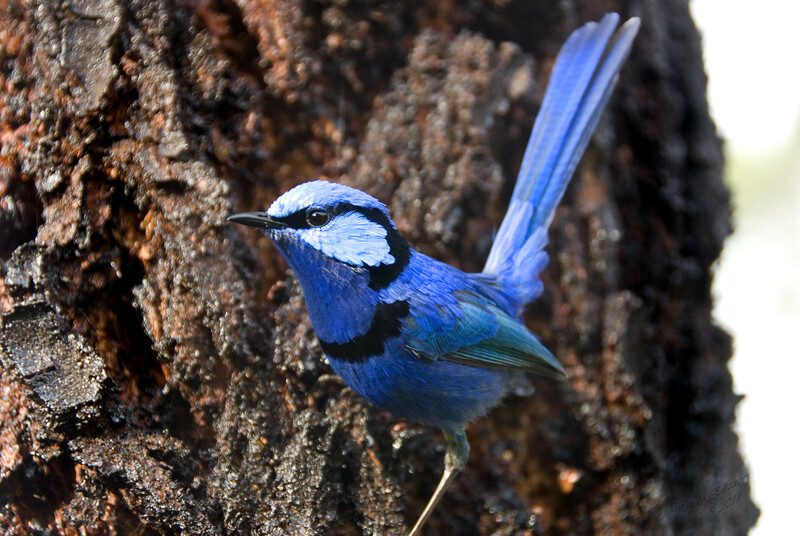 My heart was filled with sadness for the little bluey left behind, hiding in the branches, afraid, his life totally torn apart. 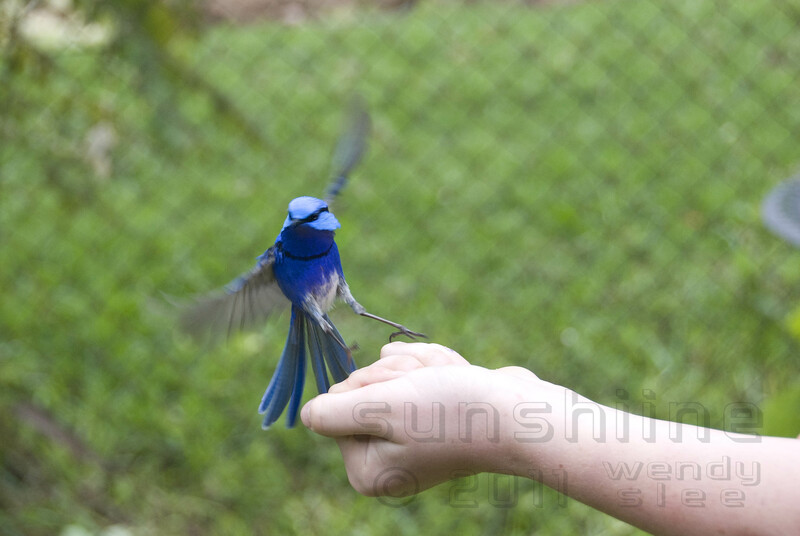 Yet even though he was very nervous and afraid, he would still hold onto the one constant thing he knew, and that was to fly to my hand and sit for a moment. Perhaps he was oblivious, but I felt he sensed my grief and it matched his own bewilderment and uncertainty. But within a day, I awoke to hear him singing his heart out as the sun arose. When I went outside he was merrily dancing in the trees, entertaining a new girlfriend, both of them singing their song of life unfolding, of the mystery of goodbyes spelling new beginnings…. Life goes on….. and all that matters is the moment and how much love and song you can fill it with. I can cry because it’s over, or I can laugh because it happened, or, I could do both. Because you can’t have one without the other, you cannot know such joy unless sorrow carves a cavern in the darkness that will be backdrop to enhance the light, an amphitheatre to contain and measure the exquisite wonder of life’s grandest performances. How can I truly appreciate and honour the presence and awareness of one’s gift to me, unless I experience the absence and subsequent emptiness without it also. So I give thanks in these words, for the gift brought to me by a little blue bird. Tell a world how it should feel. It dulls the earthly pain. Of the monster when it’s gone. Where the eagle used to fly. And a forgotten spirit dies. Well it’s just a funny old day. There’s no way else to describe it. Bit like life at moment…. Bits of this, bits of that, nothing flows, one minute you’re up, the next you’re down… constant, ongoing, chaos and turmoil on every level. Even the peaceful moments are….well….”loaded”! I know that things are moving, changing, shifting and we are meant to be changing and growing right along with it, but some days, I do feel like I am being dragged along by the scruff of the neck or being trampled underfoot by the energies as they surge past me! I am an aware being, doing my best to embrace the change, be the best I can be, and to shine a light, but really? Most days I feel like change has me in the stranglehold and the light seems to shine out of the most inane and unexpected places in its ongoing war with very stubborn and repeated waves of darkness. I’ve been absent from the tearooms for the past few weeks. We had school holidays with its upheaval of routine and relaxation of rules, and before that, I had several weeks of some wicked little flu virus that made coughing too easy and socializing and talking impossible and with all the maelstrom of activity in the street, laneways and courtyards around the Artgeo cultural precinct, it has honestly been easier to stay home on the farm. So I have spent the weekend, enlivening myself, inspiring my being, and doing all I can to just expand my consciousness. I have attended a Secret Women’s Business Retreat, and shared in traditional teachings, stories and medicine of local Nyungar women. 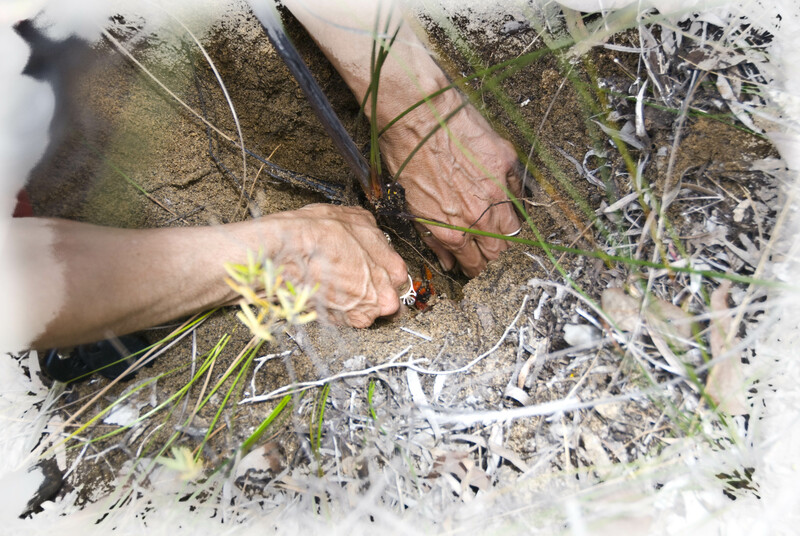 I have placed my hands in the earth to quiet my worldly mind, and be more attuned to the Earth Mother’s energy. I have lost myself in the healing power of the bush and nature, and found myself in the cool clay and ochre as my face and body were painted by caring hands. I I have rediscovered my strength and dignity in a women’s circle, and felt my heart open even more. 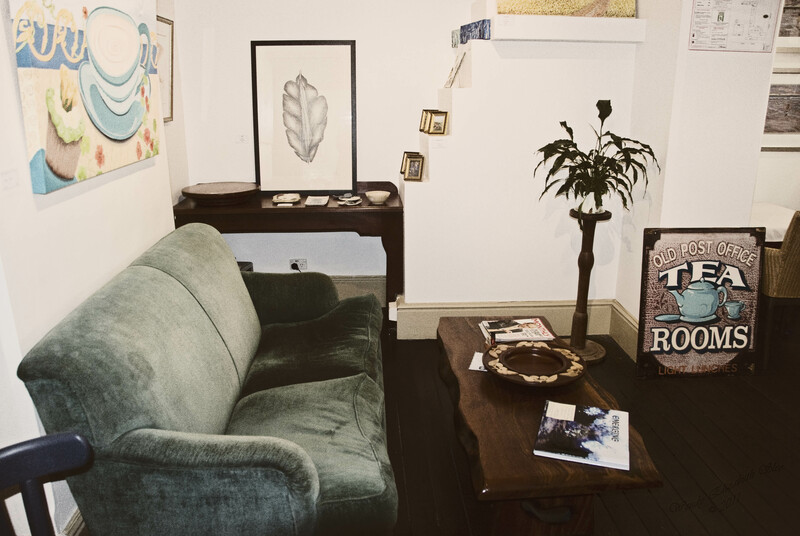 So having remembered who I am, at a soul level, I have embraced the day and arrived at the Tearooms, looking forward to Brenda’s smiling face and love and kindness that ripples throughout her bright little rooms. I have braved the landscape in upheaval, with every inch of the surrounds of the art gallery, cultural centre and tearooms under excavation with danger signs, fences, blockades and guards, not to mention many forced new entry and exit points hidden in dark corners (you’d be amazed at how many doors are in these old buildings that no one even realizes are there!). 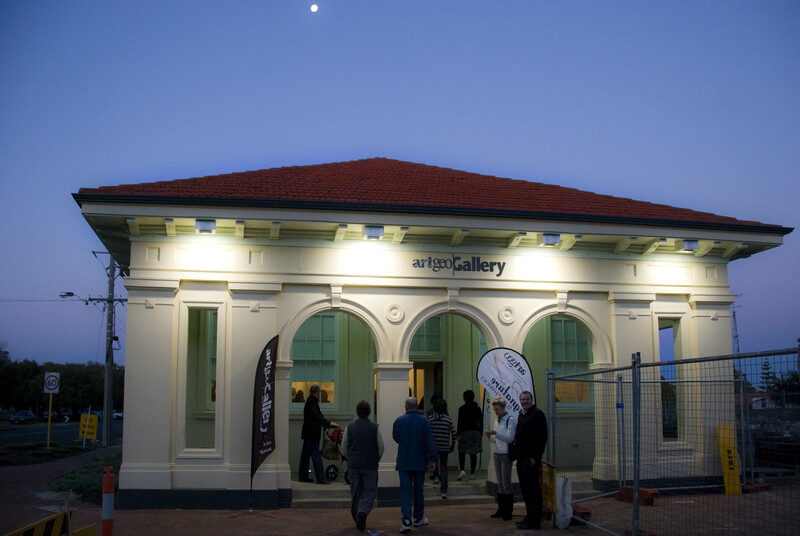 I have to confess, I have felt chagrin at the Shire’s timing of these upgrades, especially having them happening at the time of their major art exhibition for the year – the Signature South West. It is near on impossible to visit the main gallery, and very off putting to any one who intended to view the magnificent exhibition themed on Trees. But…. All for a good cause I tell myself, the result will be worth it, even if the roadworks and confusion continue well into our summer and tourist season. So I shrug it off and focus on the first welcome cup of coffee and some inner peace. And I open the local newspaper. 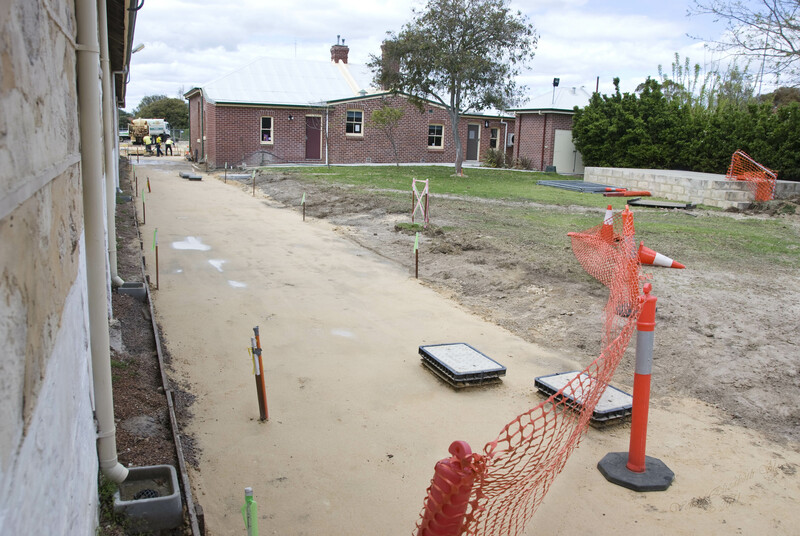 There is the headlines that the Busselton Water Board is proud to announce the chorination of our pristine water supply is to begin next week. The chairman for the Board stated he was pleased that the final contract in the million dollar process was set. As spokesperson he thanked the customers and community for their patience in this process. It was at this point I had to close the newspaper and pick my jaw up off the ground. I did not know whether to laugh or spit my coffee. I seriously doubt there has been any “patience” in this process, or that any single customer or water consumer in this shire shares the pleasure of this announcement. In fact, it is an insult that such platitudes are being offered to a population who have come out fighting this process from the very beginning, a population who have had this toxic treatment of their water supply forced upon them against their will and the better advice of countless experts. I am reminded of the current wave of protests sweeping around the world at present, originating with the “Occupy Wall Street” movement. One percent dictating how the rest of the world lives – One percent in a safe and comfortable ivory tower enforcing their beliefs and agendas on the masses with the basic intent of further feathering the said towering nests ….. I commend every single person who is waking up now, seeing the bigger picture, and standing up to say “enough is enough!” How can a small number of people hold such complete and destructive control over the future of the planet and everyone upon it? Easy I suppose, if the rest of the population allows it, or looks the other way. So here, we have a select group with perhaps other agendas compelling their actions, telling the town that they will have a poisonous substance mixed in their water supply whether they agree to it or not, and they will be grateful for it. And my concern goes out to all the schools in the district surrounding the main water depot where the chlorine will be added – I can only image the children drinking innocently from the drink fountains and getting the first rush of chlorine into their bodies. Not a happy thought at all! I turned the page of the same newspaper to see a large quarter page advert entitled “The Truth about Vaccination” Such a misleading title because if the “truth” be known, this advert is all about blocking that same truth about vaccines rather than promoting it. For many years, I have been following with interest anAustralia wide group known as the AVN….. Australian Vaccination Network. My reasons are personal, as is my journey through the vaccination minefield…but suffice to say, when your own child becomes a victim of vaccinations, and you spend 22 years of your life raising an intellectually handicapped child whose symptoms began the night of her immunizations, then you have legitimate reason for investigating further, in fact, it is only to be expected that you would do everything in your power to seek out the truth. Over the years, one of the saddest and yet ironically reassuring things I have found, is meeting other parents like myself, who have either lost their child, or have an autistic or intellectually handicapped, (or both) child due to vaccine damage. I would rather be alone than see others suffer the way my family (and in particular, my child) has, but it is comforting to realize I am not alone and that I have a very strong support network for the way life has been changed by a simple medical process. Enter the AVN whose work brings together parents around this country who feel as I do, not necessarily ANTI vaccination, but just very wary, not necessarily angry or looking for any form of retribution, merely wanting to express the truth and warn other parents so that their families do not suffer the way ours have. And finally to build an organization to uncover the real truth about vaccinations, the real dangers, and explore all the lies and half truths that are being told and the information that is being kept from the public. The AVN is about pro-choice, about offering a balance to all the information currently available by the medical profession and pharmaceutical companies and the governments who are financed by them. The AVN does not advocate “Don’t vaccinate”. It advocates “Don’t vaccinate UNTIL you have looked at all the information”. Unfortunately there are many who would have a lot of the information (especially that which shows the ineffectiveness or danger of vaccinations) kept from parents so they never have a choice, and just go with what the system tells them. The only way it seems they can do this is to tarnish the name of the AVN, to discredit them at every turn, to make anyone within that organization’s life hell with lawsuits, paperwork, arguments and at times, even death threats. Oh yes, you’d better believe it. There seem to be some pretty nasty folk out there hell bent on you or I, as parents, never having all the information and never having the choice about vaccinations. It’s the censorship and denial of my right to choose, that makes me angry, and makes me even more intent to fight. I am not against vaccinations, but I am against mandatory surgical procedures being forced upon my children and I, and I am totally against the erosion of rights and freedom of information!! AVN have set up public information meetings and seminars, only to have the venues cancelled at the last moment, due to pressure by the various groups who would silence the AVN. There have been negative press stories, “anti AVN” advertising, and trumped up lawsuits, mischievous and fraudulent claims laid against the AVN and even it would seem corruption in the way such charges were handled and subsequently reported, so that AVN appears to have done the wrong thing. I’m afraid that when you step back and look at who has done what, the stench of corruption and agenda comes not from the AVN but those who would silence one side of the debate, and use all manner of dirty tactics to do so. I guess it makes you wonder what is behind all of this and I doubt it is the wellbeing of humanity. Somehow I believe it is money… and control. So here, in my own local paper, is yet another such tactic. This week we have a much appreciated public forum in this town, presenting some of the information that has been hidden from the public over the years. The AVN advocates are presenting this talk in town, and now the anti AVN propaganda begins. As usual, they have no argument, just mud slinging and innuendo. I agree with the first statement, but disagree with the second – we are experts on our own children. And when our children suffer life changing negative effects from the very immunizations that we are told are for their wellbeing, then who dares tell us we are wrong for no longer trusting the “professionals” and seeking alternate advice and information from whatever avenues we can access. In my humble opinion, these groups opposing AVN are also experts at fabricating evidence and misrepresenting data. Talk about hypocrisy! In all of the instances above, the anti AVN group does just the same. So do pro vaccination groups. They all do these very things in support of their own argument, but now there is one lone group that stands up to present the opposite side of the argument, in a much needed attempt to create a balance, and advocate safety, they accuse them of wrongdoing. This is such hypocrisy. These groups have unlimited time and budget to go around trying to silence one side of the vaccination debate, and remove any opportunity for parents to seek the truth about vaccination safety and effectiveness. 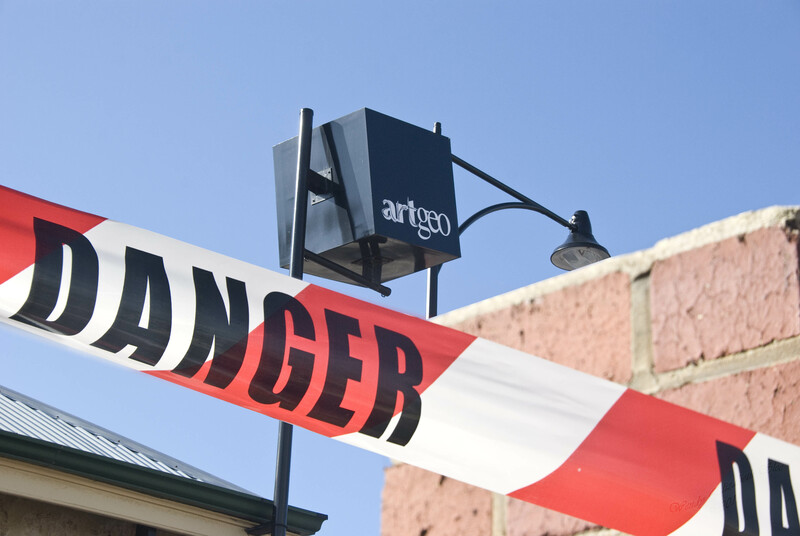 If you take a look at their advert you see big sign saying “Health hazard – STOP the AVN”. The biggest hazard to health and wellbeing in this country is to have our rights taken away or the balance both sides of a debate and freedom of information denied us. This very group, instead of focusing on the good that they supposedly believe vaccinations do, and building upon what they believe is true, are just intent on a smear and mischief campaign against anyone who disagrees with them, a campaign that reflects badly on them and definitely makes you wonder about their intent and their agenda. That is undemocratic and un-Australian. In this instance, I discovered that this particular group have contacted the local shire council in an attempt to deny the AVN the use of any shire buildings, or even to deny access to the town. All I can say is….. Do we live in the dark ages? Do we really want to allow such censorship and denial of rights in our lives? (note) I did go to the seminar, and it was very interesting. If I doubted the safety and effectiveness of vaccinations before, I am now even more convinced that I am on the right side of the argument. And can understand why the other side would be so hell bent on silencing such clear, precise and honest reporting of the truth. Because if people wake up to the truth it will cause the money flow into the big business of pharmaceuticals to dwindle. So sigh. There we have it. The ugliness has reached my own local newspaper. All because a group wishes to have a public meeting in this town at the request of concerned parents. Anyone would think they were planning to inflict great harm on the planet instead of actually being the ones to turn the tide of damage being done by the pharmaceutical and chemical industries that our generation is besieged with. Oh yeah…my day decidedly went a bit wonky reading all the propaganda in the newspaper . Now I remember why I try very hard not to pick up those useless bundles of paper for anything less than litter tray liners for my pets. Wouldn’t it be nice to read some human interest stories for a change? Something uplifting, inspiring, positive? Something to make you believe that life is good and the future is an amazing place to work towards…. oh yes, and that human beings are essentially good at heart? Well there does not seem to be much poetry flowing from today’s thoughts…. I think I may have sat too long in the corner by myself and indeed need a piece of cake and another coffee! And when the day is done, I intend to go outside and walk in nature, and release the stress, and find some reminder that life is good and most humans are intrinsically kind, aware and blessed with common sense. And that starts with me, so if we have “Occupy Wall Street” and “Occupy Perth” we can have “Occupy Earth” and also…”Occupy Your Life” … and as it all starts with me, that is what I intend to do. Occupy my life and my truth. So no apologies for my rather strong and opinionated blog, I am just speaking my truth. Finds him gradually becoming whole again. Who dares to walk this path? Yet who dares to not. It’s a beautiful day out there, and it feels as if spring is truly upon us. 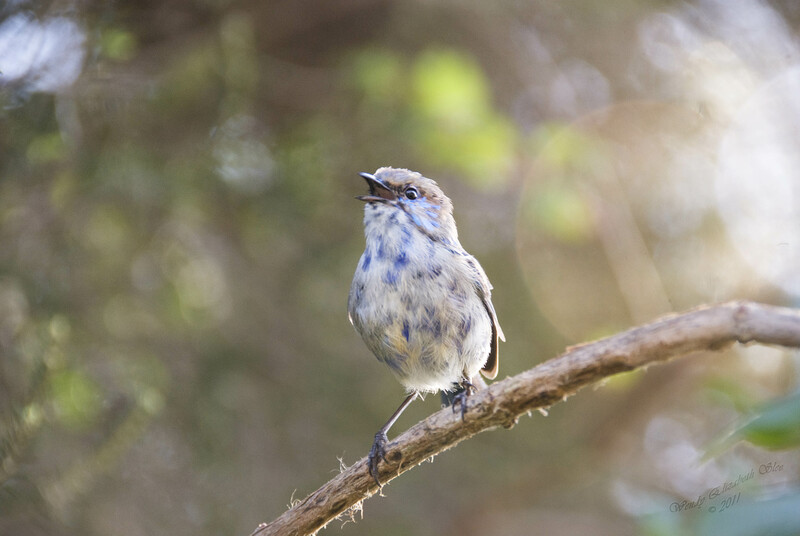 Little blue birds are singing their hearts out in my garden, and the sun is shining with a hint of summer on its breath. I walk towards the café but it looks like a war zone there. Security fencing, cages, street closures, huge trucks and heavy machinery, security guards blocking what’s left of the foot paths……they are demolishing the old police station and courtrooms on the opposite side of the street, so the ground is shaking and the dust is flying… Definitely not the energy of the café on the outside…. 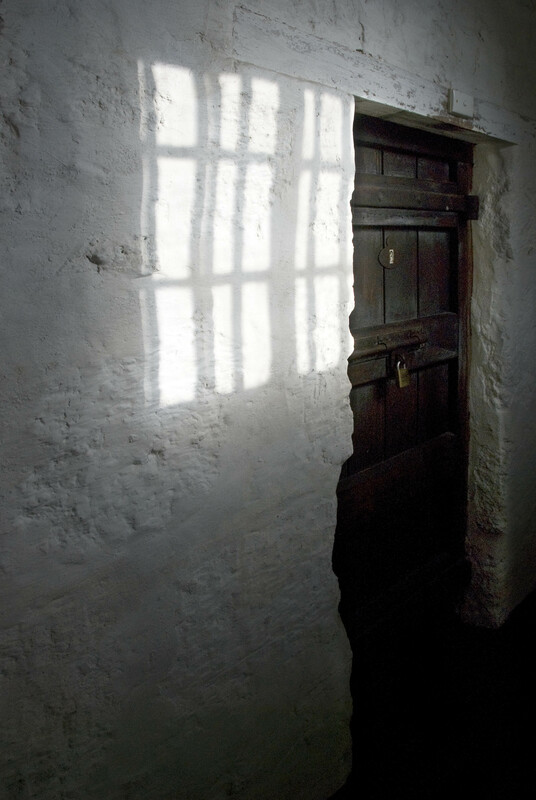 I walk on in through the “cages” and into the café and feel that “aaah” feeling…that gentle lift and settling of my being as the energy of the café and the smiles of those therein, reach out to welcome me. Here it is. Home! The feeling never changes. 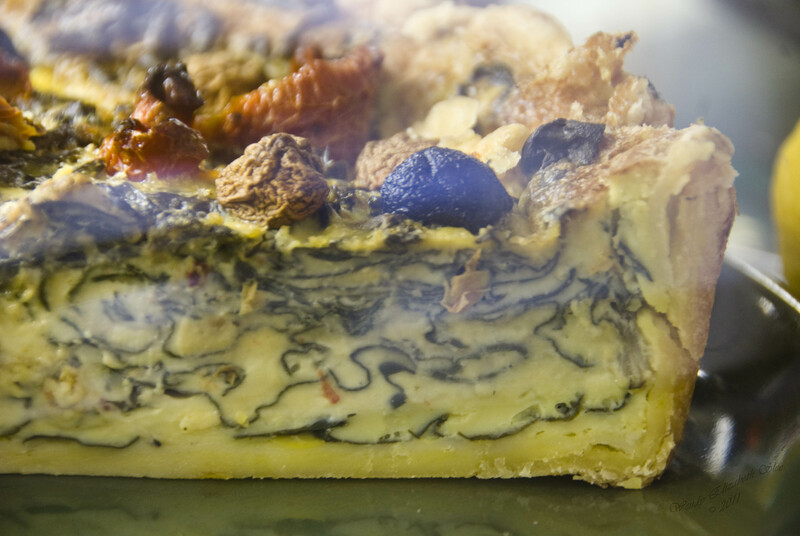 From the oven wafts the smell of a quiche and croutons baking and there’s soup simmering on the stove. 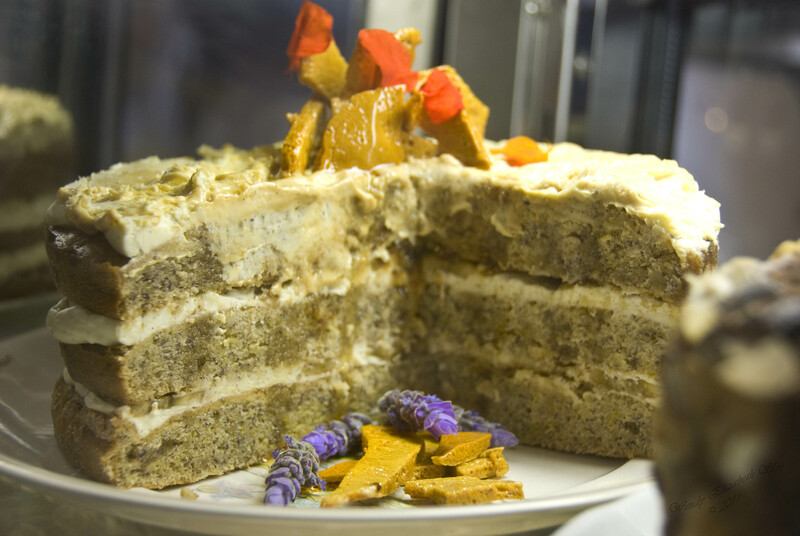 The cake cabinet is, if possible, even more extravagantly exciting than ever before. The colours and textures defy belief! “Heidi went wild!” says Brenda with a smile, and I can see that Heidi has not only been baking again, but like everything else in this café, she has been expressing herself in the most artistic way. But wait, there IS more on the second shelf!!! This one perfectly summed up my entrance to the tearooms this morning!! Made the trip to your shop worth the trouble! It may not be so simple tomorrow as the workers inform the gallery managers that the street required digging right up to the front wall, which means NO front entrance! Where the footpath is will be a bulldozer and if they don’t dig carefully, possibly a fountain! 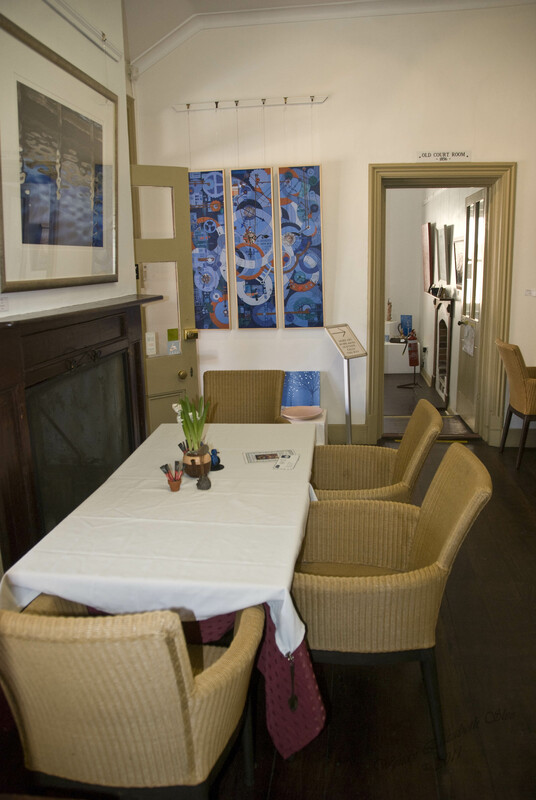 The gallery managers suggest closure of the gallery and tearooms, but that just does not seem feasible. There are staff members who require hours and need to be paid, as Brenda says, there are meals being planned and confections already prepared for this week, and so the Café should remain open for business, with just a more adventurous path inwards for those daring enough to come find the heart of the building! In Brenda’s words, it’s the agony and the ecstasy today… making decisions for the café that are fair to all. After much discussion, Brenda decides to close the café to the public tomorrow but to use that time to complete other jobs here – repolish the floor, rearrange furniture, pack up wholesale items that will no longer be for sale (all those beautiful old teapots and crockery), and for her and Heidi to make a start on the Christmas cakes….. (aaargh…there’s that word…”Christmas”… it’s starting to creep into vocabulary around town, I guess it’s only a matter of weeks and the reality will appear on shop shelves and displays….and start ringing through the supermarket speakers and repelling us from shops quicker than any security guard). 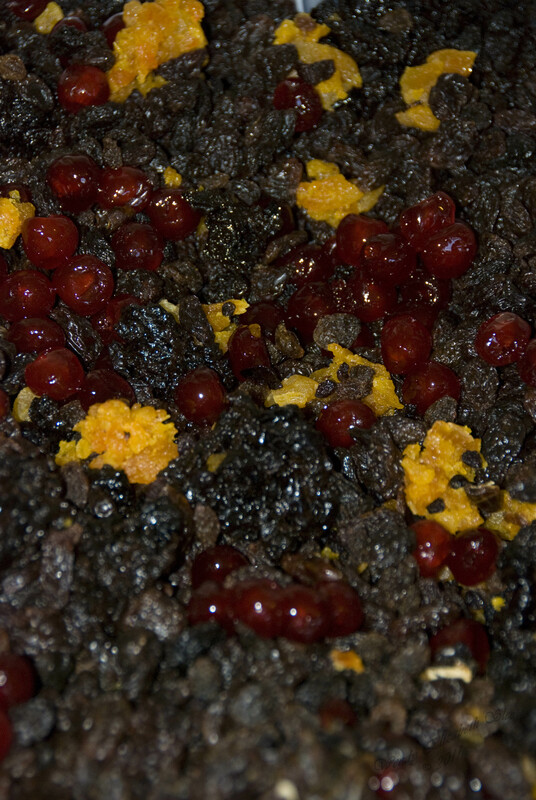 The containers of all the dried fruit come out and the mass production of this season’s gift begins. 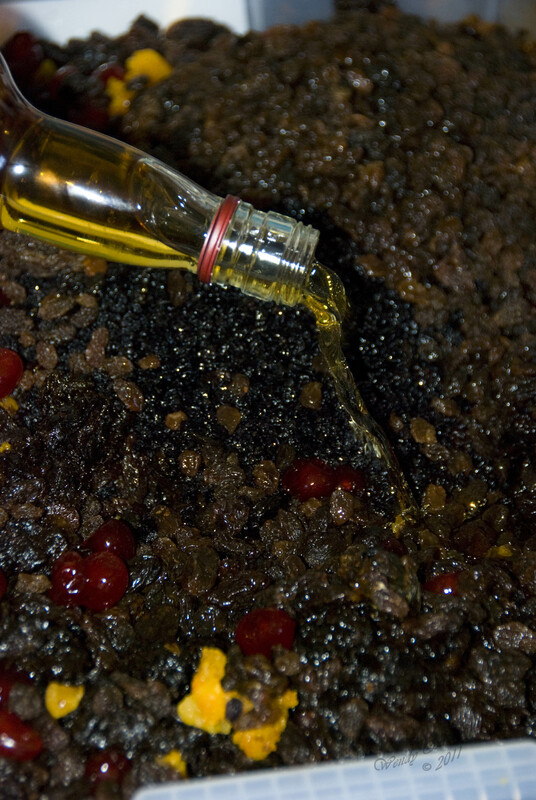 The giant containers of fruit glisten with colour and texture, as they get combined, and the bracing smell of whiskey arises as the bottles are poured into the mix. I wonder if there will be any sixpences added to these puddings in the making. I feel inspired to go home and plan my own traditional Christmas puddings and cakes. The post master – he had gone. A lovely place to stop for afternoon tea! China cups and teapot and beautiful cakes to see! You have created a nice teashop! Over the rim of a teacup. That’s a wonderful truth! How many of us have memories of visiting a parent or older friend at various times of our life, when we have sadness or pain, and being given a hot cup of tea to help ease our troubles while we talk, or just sit quietly. 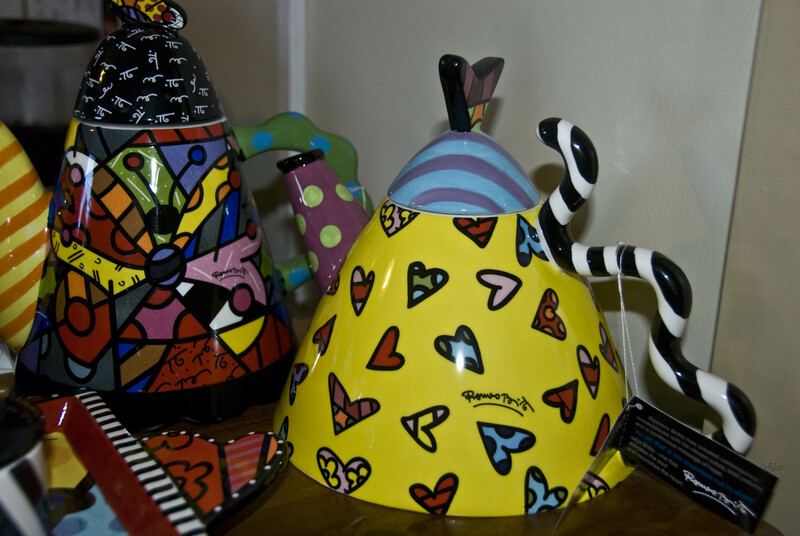 I know some very special people whose first line of support is to “put the kettle on”. Don’t you? We talk between us about the healing power of the hot beverage. 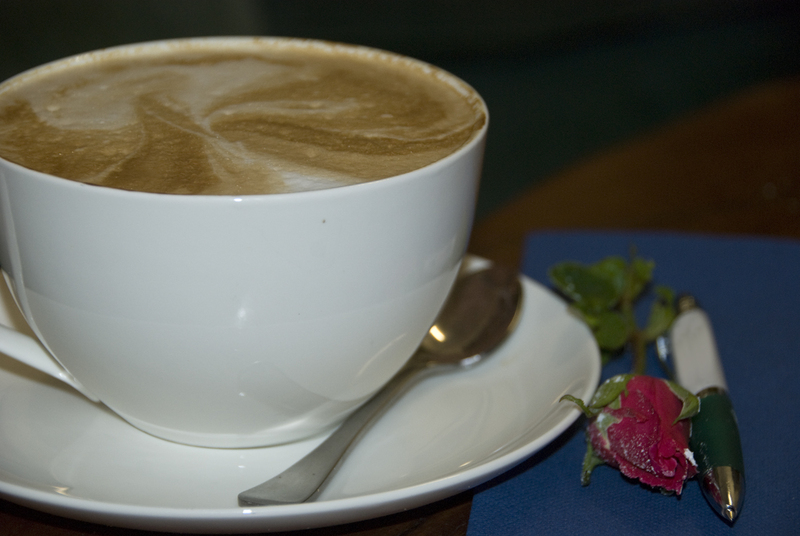 From a hot chocolate for our children at night, to a cup of tea with our parents…. 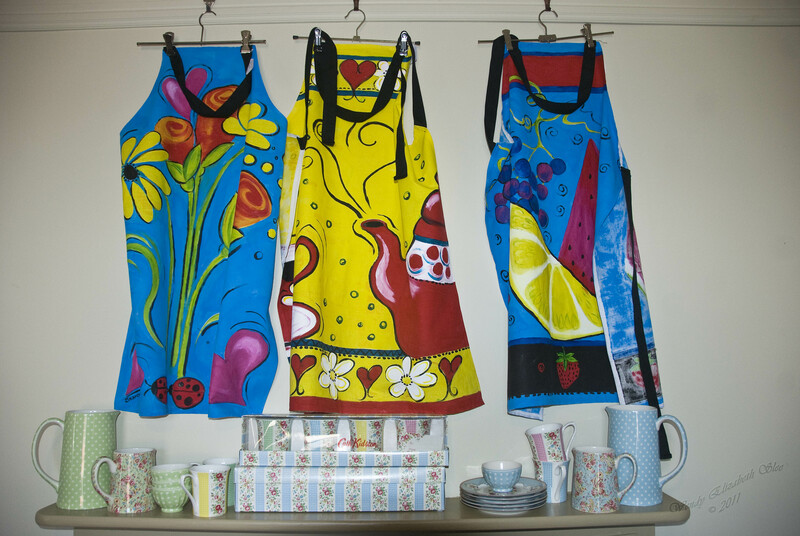 Many women are the makers of the “cuppa’. But what of the joys we get when someone else makes that cup of tea for us ….? Brenda recalls the joy of someone else making her afternoon tea, just as I remember that feeling when after a tiring week of caring for my family, I visit a friend who lets me sit down while she makes me a coffee. It’s a simple but much valued gift. 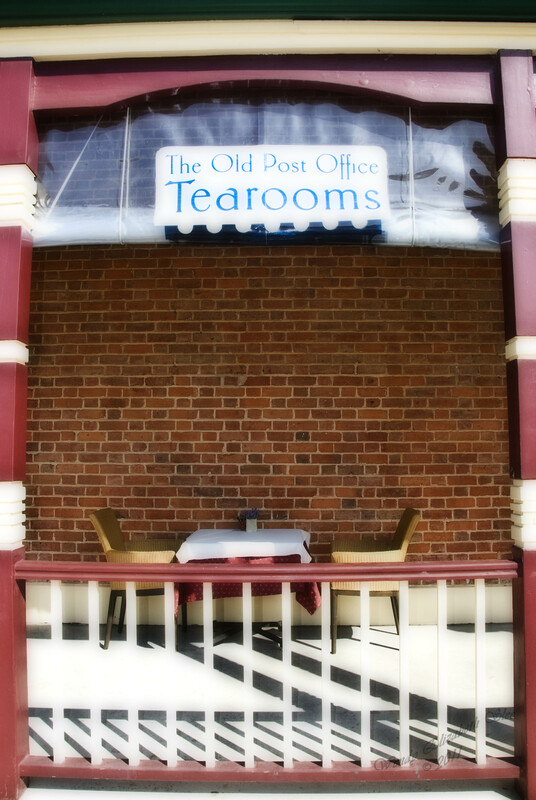 And it is part of the charm of the tearooms too. It’s the “giving” and the “caring” behind every cup that makes this place so very special. I think the longer I am in the café, the more I get to see and hear. The “behind the scenes” is very enlightening…. You do gain such enormous respect for business owners in the hospitality industry. And empathy too. I helped Brenda one cold, dark evening when she was here alone, to pack up and carry in all the tables and chairs on the verandah… folding cloths, putting away plants, decorations, sugar bowls – the furniture was heavy and I even worked up a sweat. 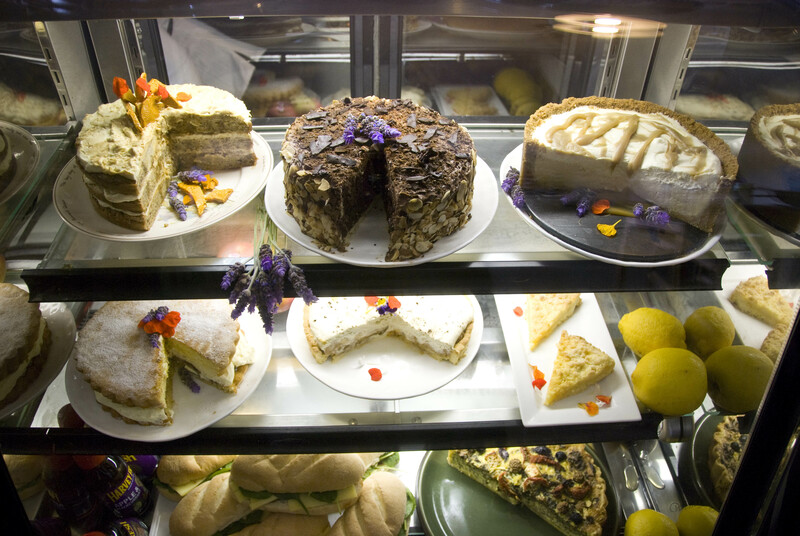 And Brenda does this every night and puts the furniture out every morning… along with the decision making, the precision baking and prep work for the day’s fare. Not to mention her care and support for her staff. Again I think of the expression “labour of love” and know it to be true. 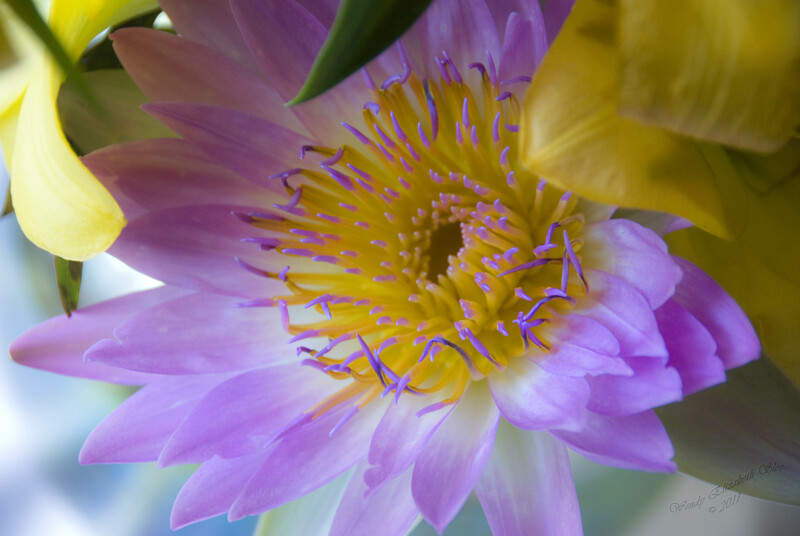 Now, back to my garden and little blue things….I made an interesting discovery last week. 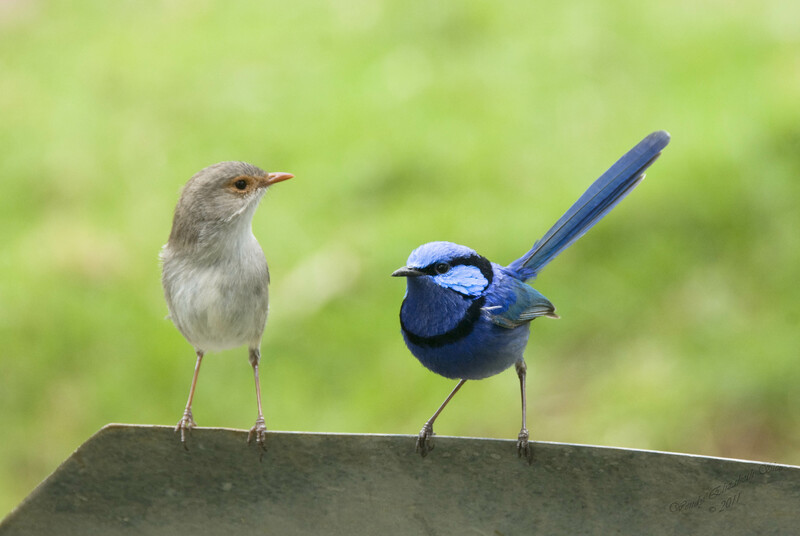 I think I have mentioned that my blue wren family consists of Blue Boy, the male, and his “Henny” the female, and a young female from their last nesting season (last summer). 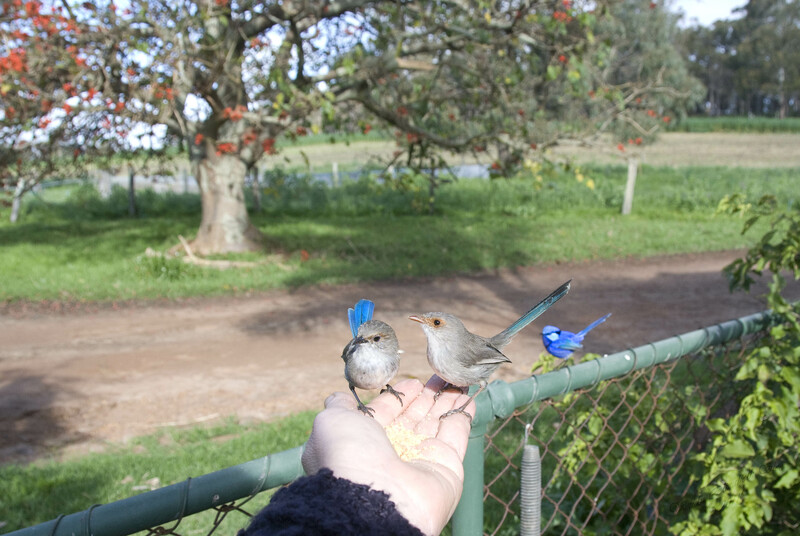 I’ve learned that even when the blue males lose their feathers and appear to be the same colouring as the females, you can tell them apart because the female wrens have orange coloured skin around their eyes, on their legs, and their beak colour is orange. The males have black or very dark skin in these places. But then the little one landed on my hand and I got a surprise. “Her” beak and legs and skin colouring had darkened like the male bird, even though “she” still had a grey plumage like her Mother. Now, that really got me wondering “Was ‘she’ a ‘he’? ?” Then I realized that would explain the open beak display she was giving the male bird. Like with baby foals, or young horses, who open and close their mouths as a sign of respect for an older or more superior horse in the herd, this was a sign of respect towards an older, more superior bird. And that would make sense that the juvenile wren was showing “respect” towards the dominant male bird in the family. The next day after making this observation, when the young bird landed on my hand, I noticed tiny flecks of brilliant blue emerging from the soft grey feathers, the beginnings of a spring plumage. “She” was a “He” !! It was no great discovery compared to events in the rest of the world, but for me, it was just momentous! As the days went by, the blue became more and more noticeable, as did the relationship woes between youngster and father. The male wren would chase the little one away at any point where I was interacting with them, and the juvenile wren would make the “open beak” respect sign at him, or fly away and hide. But he did not go far and still would come out when the coast was clear to land on my hand as he had done in the past. I felt a bit sorry for him, with his spotty, scruffy, half grown coat, he looked kinda disreputable, and a bit “down on his luck” especially when the older Blue Boy chased him away. At one point, when “Little Blue” as I called him was on my hand, “Blue boy” flew in with such a vengeance and chased him so blindly that they both flew into the side of my head. 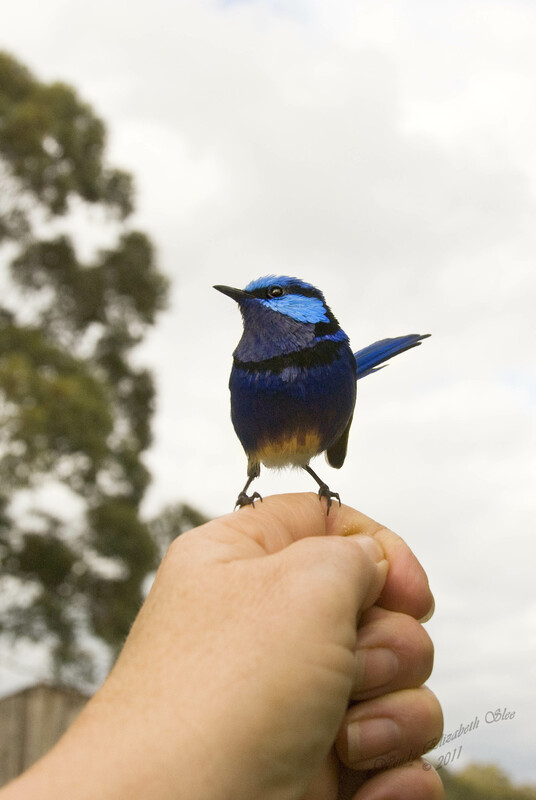 Talk about the dangers of befriending blue wrens!!! 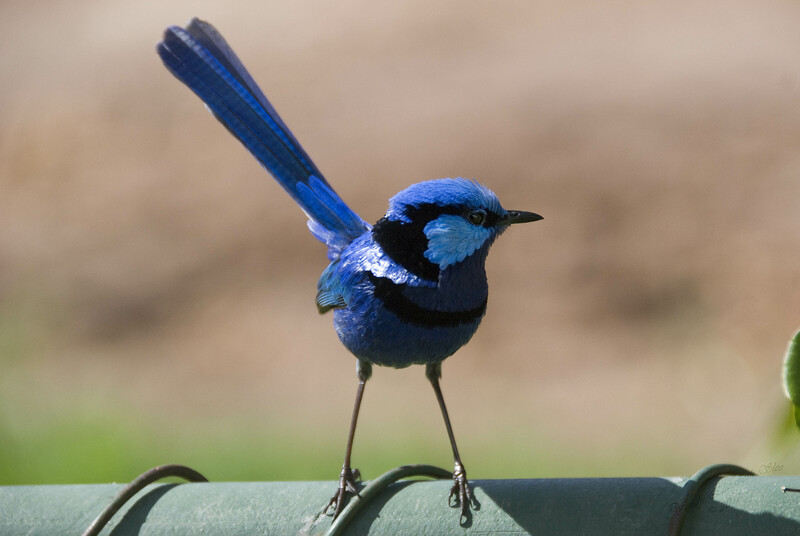 What was however, quite inspirational, was to watch the young Blue wren realize he had a song. He would sit alone on a branch and throw his head back and burst forth into the most powerful song. It really was the most amazing thing to witness and hear! Over a few days, his song became loud and clear in my garden and I loved hearing him sing his presence and his heart into the world. 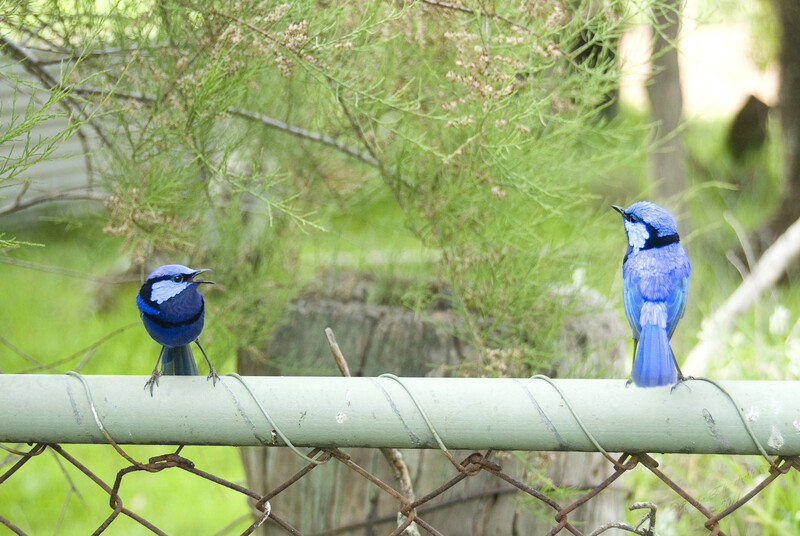 I was really happy to think I now had TWO Blue boys in my garden that would respond to my presence and the camera, even if they did not much like each other. I tried to seek “Little Blue” out quietly and give him so treats, so he would not be driven completely away. 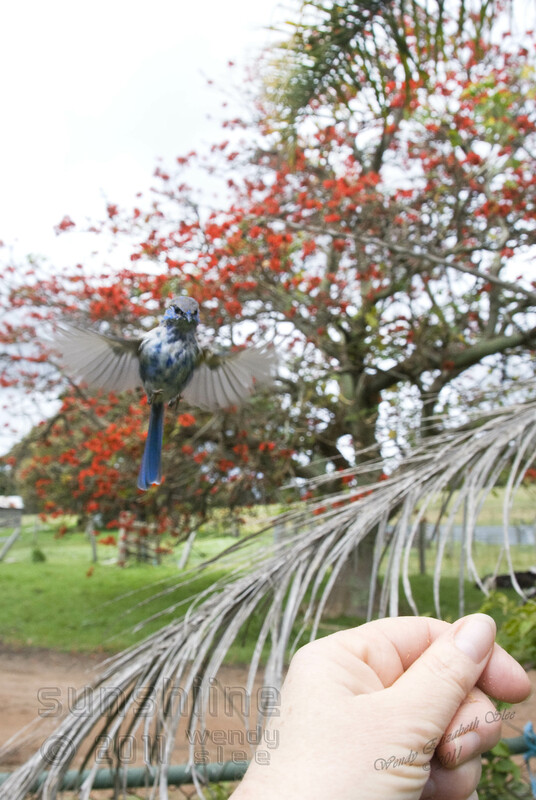 The irony was not lost on me though, that even if my original Blue Boy would drive this little fellow away, there would come a time when the tables would turn, and this young male would become the king of the garden and chase his old Father bird away. I guess that made me sad, even though it was simply “nature”. So there they were, not caring that days might be numbered, or positions lost, or that the world was full of crisis, pain, wars, debt and chaos, they just felt their own song rise up in their hearts and let it out to the world for no other reason than that they were alive, and they could sing. And do you know? I believe the world is a better place for each and every note they freely put out there….. with no thought or expectation of anything except the joy of expressing their place in existence. A very ambitious spider had spun huge lines of web across the garden path, back and forth from a tree, to the gate, and across to the garden. 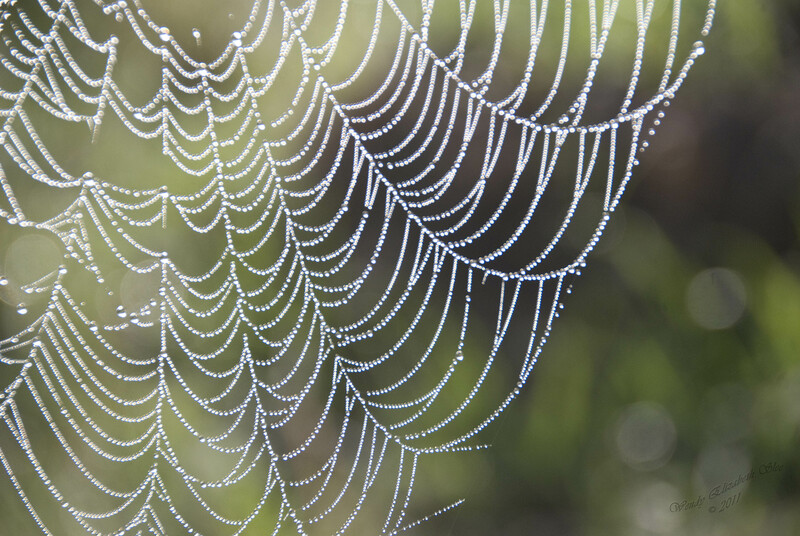 There was no intricate web, just these “do not cross” lines of strong white web, that glistened and sparkled with dew drops in the early morning. The clever thing had even strung them over to my car and locked that down. 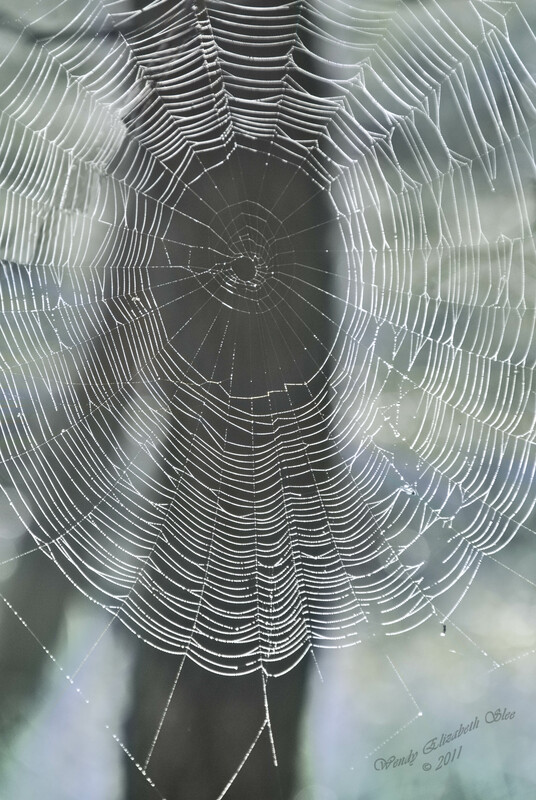 If the web had been striped with red it would have looked like a crime scene or danger zone! We had to laugh at the ingenuity of it ….I wonder if she thought she would stop anyone leaving and feast slowly on us all before we could escape! We saw no sign of the spider responsible, but I can only imagine it was a big one! Nature is so fascinating. When I walk on these early winter mornings, the webs adorn fences and trees and bushes like many precious jewels, glistening with the raindrops or dew. 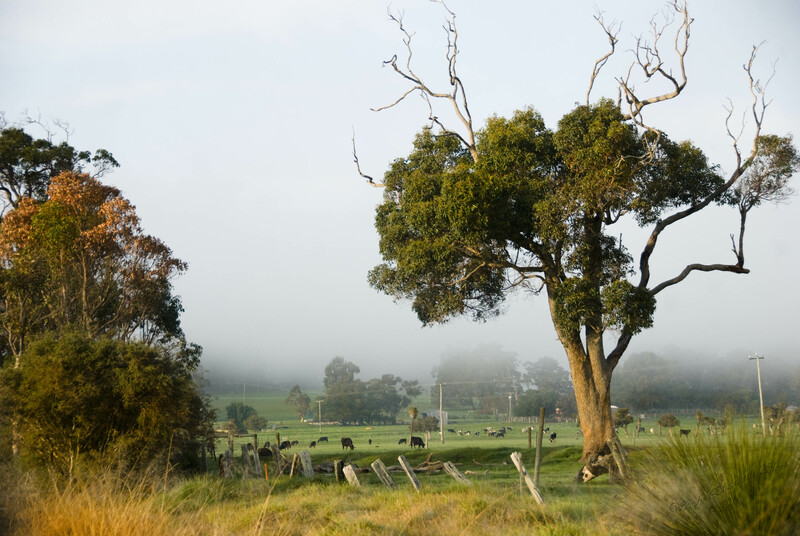 It seems like at certain times of the years, the bush and native areas, as well as farm fences are literally splattered with diamonds and pearls…… I love winter! 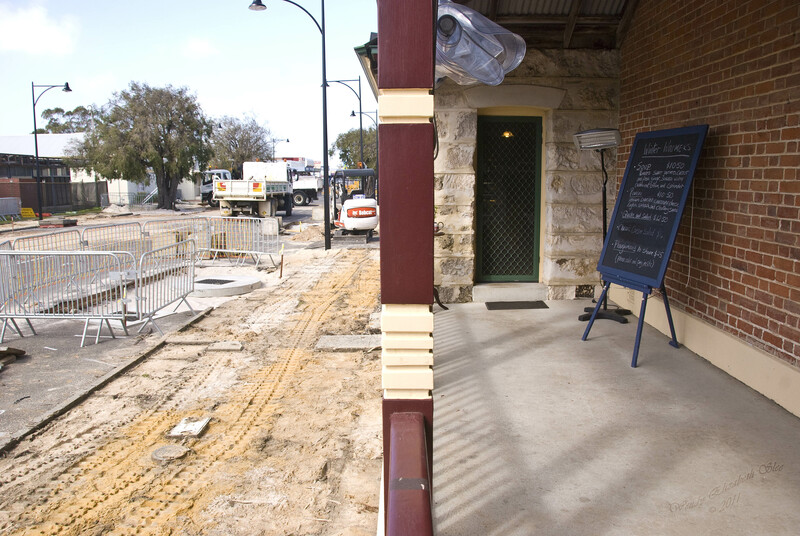 In at the café, the verandah is empty due to the street works, it looks very quiet, but don’t let that fool you! A room in the art gallery has been set up so café patrons can sit inside and continue to enjoy the food and beverages away from the dust and noise of the renovations outside. And the green couch is still there too. By (sic) hyacinths to feed they soul. I came in for a bite to eat. I looked around and chose two seats. To sit and chat and enjoy some pie. She is my daughter, now you see!! But professionals built the Titanic! For quite some time now, I have been wanting to generate some interest in Haiku here at the café. 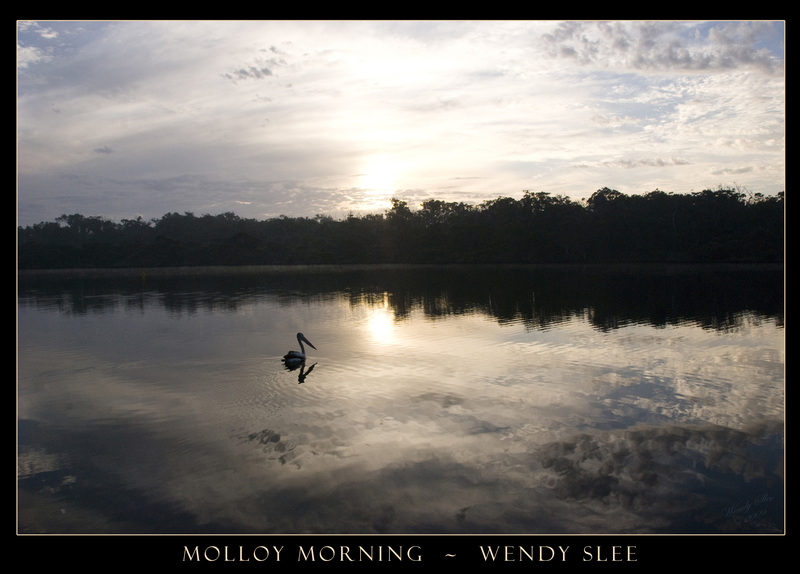 The Haiku is one of my favourite genres of poetry – to me they are like an exquisite, polished jewel… a tiny cameo image of a personal gift from the natural world, or from our own journey through it. a warm hand on my shoulder. 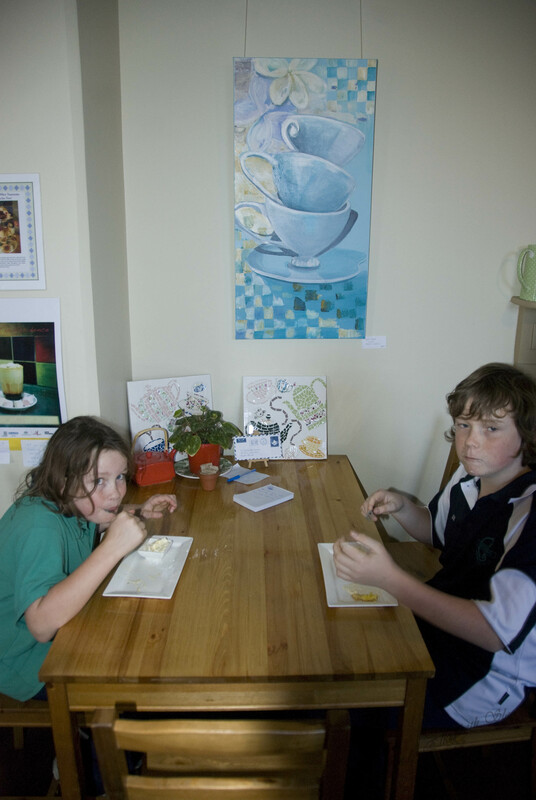 My children love Wednesdays, and coming to the café after school to meet me. 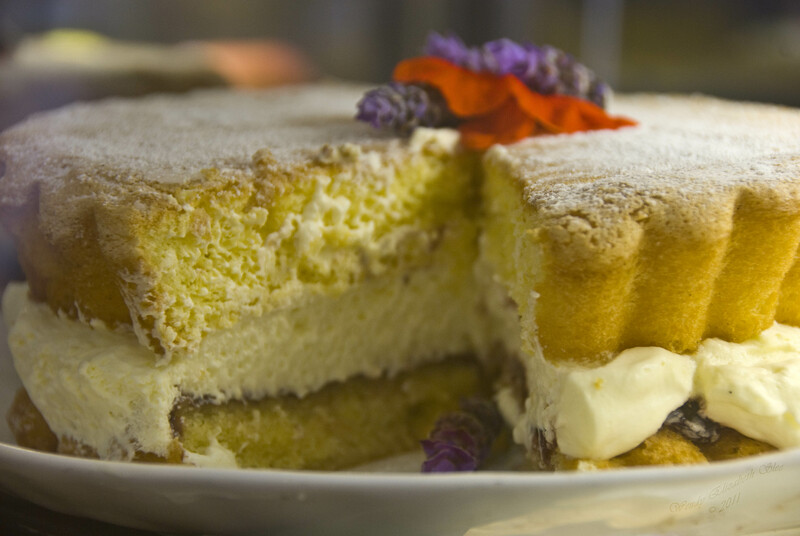 They love sitting at the table and having a cake of their choice brought to them on a pure white plate with a flower beside it and a bowl of cream on the side. 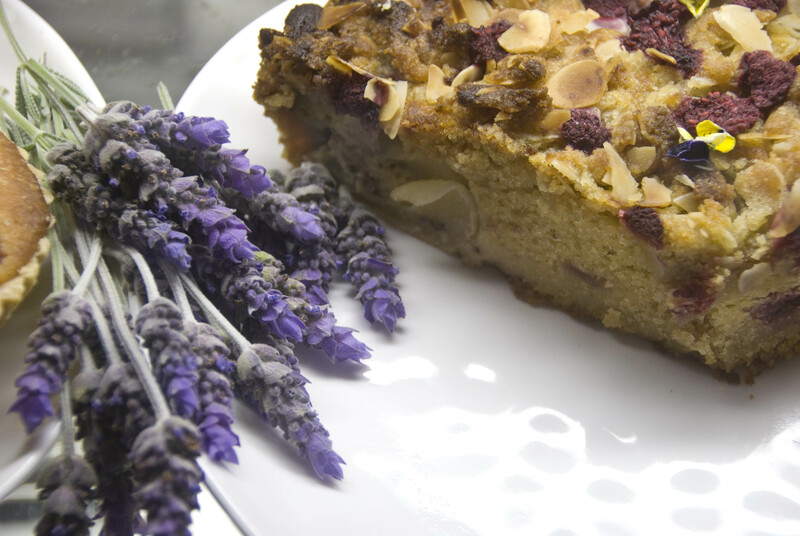 Maya’s favourite is the Pear Frangipani, Sol’s is the Chocolate Brownie. 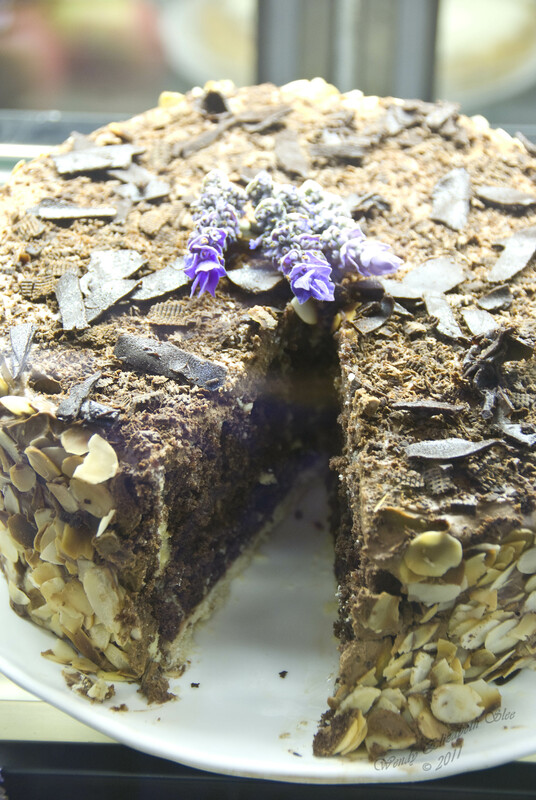 Their newest favourite is Brenda’s Chocolate and Beetroot cake. I will vouch for that – it is to die for! Their eyes glaze over as they eat. “Please Mum, ask for the recipe” they say, wiping their mouths. But I inform them that a good cook or baker does not share their special recipes, and this is never more true than here at the Cafe. 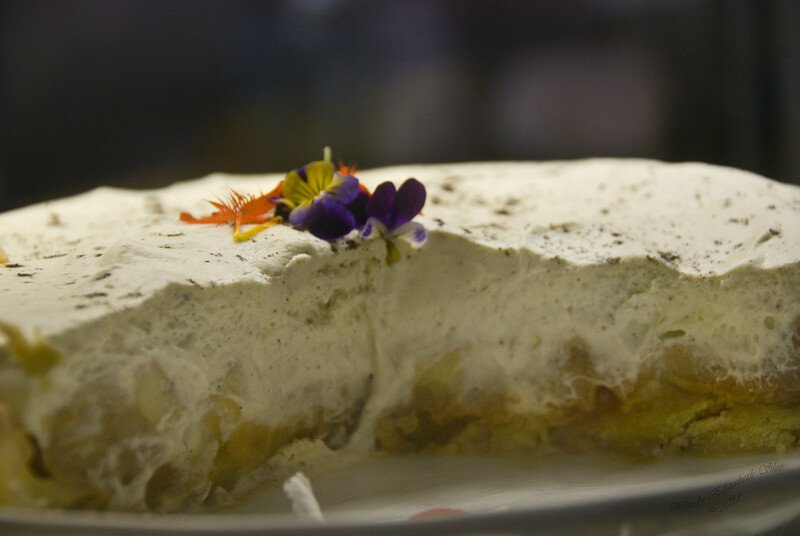 Brenda’s recipes are priceless and precious, and can only be “tasted”, never seen. 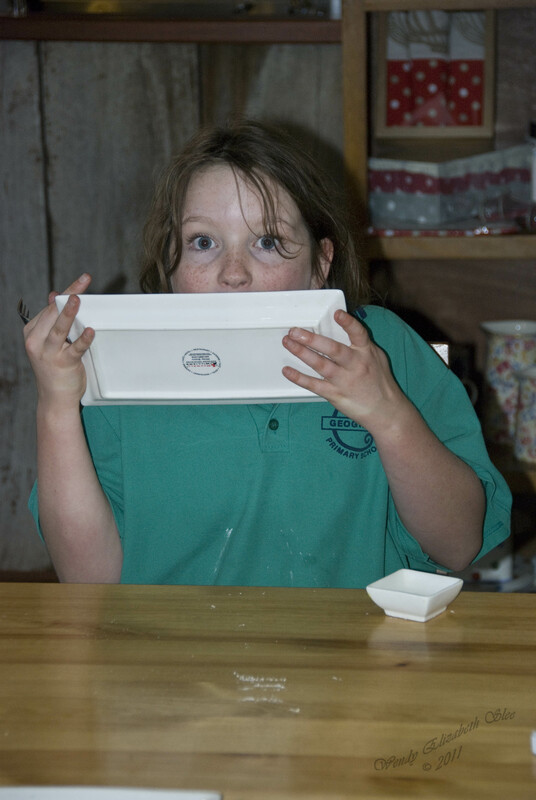 But the cake is so good it not only inspires a loss of table manners (the plates just HAD to be licked! Ahem!) but also a bit of bribery and corruption. As you go through life – there will always be something interesting happening! So says one lady in the tearooms today and I could not help but agree. She had an earring stuck against the side of her face, unable to remove it without the assistance of a jeweler. (A small earring would not have been a problem obviously but this was an elaborate sculptured piece that looked pretty sharp!) 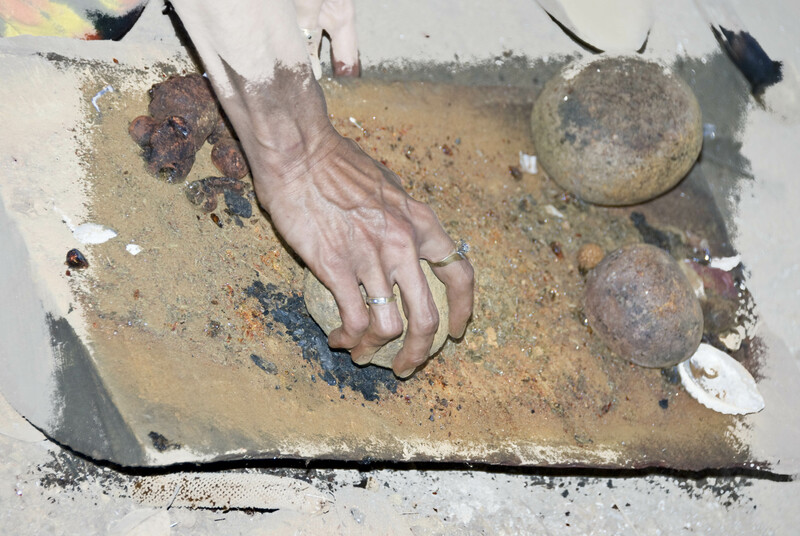 She had put it in this morning, as she had been doing for many years, the only difference being that she did it in a rush and the catch got jammed. So she stood at the counter laughing about her embarrassment and sharing a smile with the staff and customers. 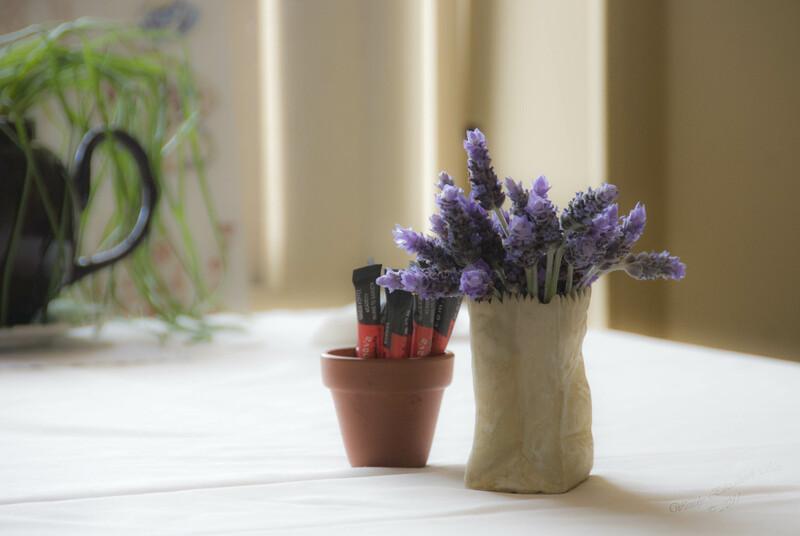 There definitely is always something happening in the Tearooms! And hopefully something that if not interesting, can at least be turned into laughter and a humorous story to share. These days there is a constant stream of events turning life on its edges, in one way or another. Don’t you agree? Some are sad, some are painful, some are stressful, most are very confronting….. while some are very exciting. 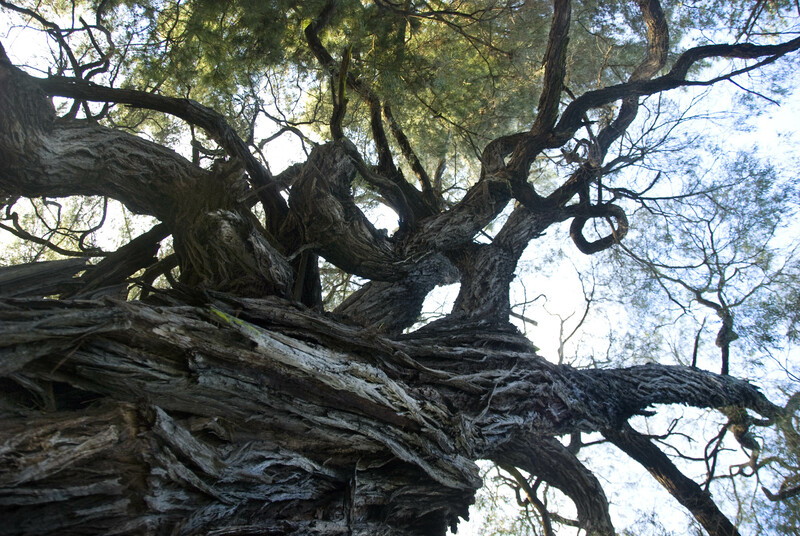 As you go through life, how invigorating it is to have interesting things happen…. Things that change the way you think or feel, things that challenge you to alter your perceptions, to change what you do every day, events which may not be cataclysmic, may not be bad, or even good, but simply interesting and thought provoking. Be honest! It’s better to have a little of the unexpected, the inspiring, the challenging, even the disturbing, than become stagnant, bored, steeped in the mundane, colourless monotony of “a rut” ! I definitely prefer life to be interesting, don’t you? And even if you think your life is uninteresting, perhaps all you need is a fresh set of eyes and a good long look around. You might just find that spark of interest where you have been overlooking for years! It’s business as usual at the Café this week. Everyone is home from their well earned breaks, and back in the kitchen cooking up delightful treats and planning the new spring menu. Well, ALMOST business as usual! 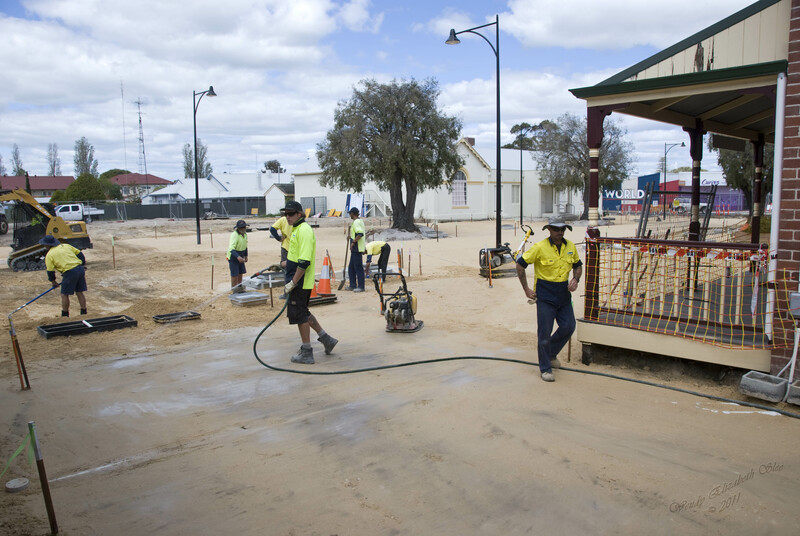 Outside in the street, things are heating up with workers tearing the road apart in readiness for the new cultural precinct. 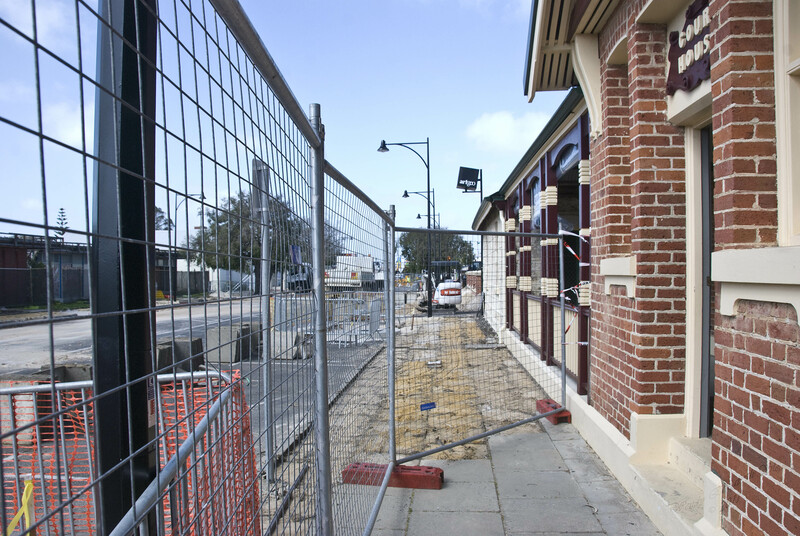 The old bitumen is being cut and removed to be replaced by cobblestone paving as part of an upgrade that will see the street outside the café become a hub of activity and entertainment. New light poles are already in place, and the old buildings across the road are being deconstructed as I write. In the future the street can be closed off for public performances and events, or used as a general mall when required. Future festivals and events in this town will certainly benefit from the changed appearance and energy of the street and cultural surrounds. 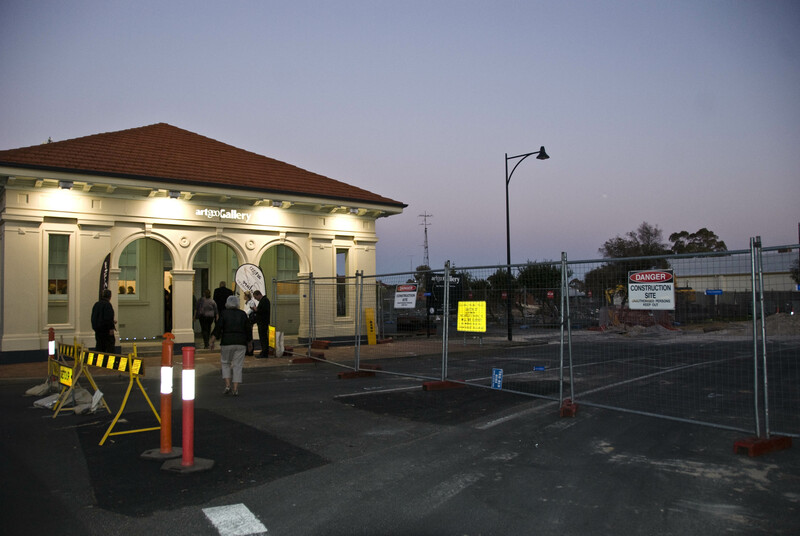 It will be a major improvement for the art galleries and the tearooms and the general feel of the area. 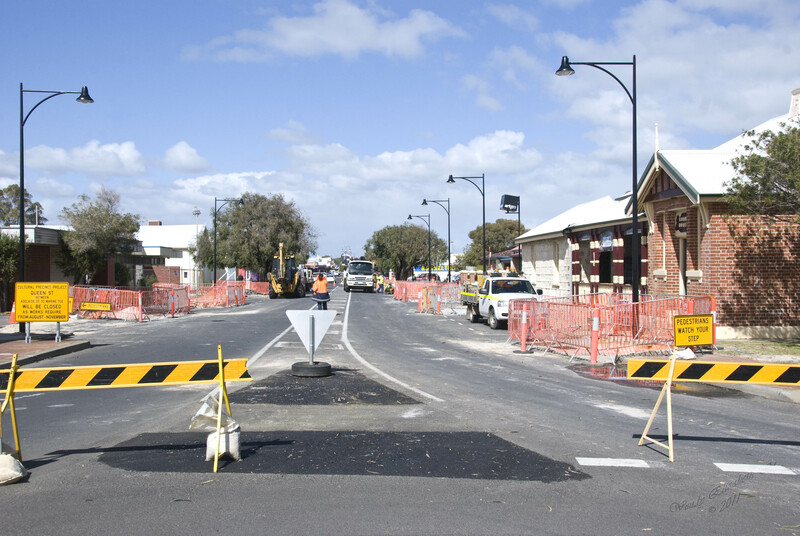 So today there is heavy machinery outside the old windows, they are digging up the old bitumen road, and removing paving. There are jackhammers and power tools grating on the ears and shattering the peaceful feeling of the tearooms. The sounds are juxtaposed against the old world music trying hard to be heard in the café…. Somehow it reminds me of the old movies of the war era, where the forties music plays relentlessly over radios while the planes are bombing the streets outside…. There seems something unsettling about such a juxtaposition of the sweet human sentiments and monotonous melody of music against the background of potential death and destruction. It isn’t easy chilling out today, but everyone knows it’s not permanent, not life threatening (I hope!) and is certainly for good cause. I think you can overcome most annoyances or grievances if you can find the bright side of the situation, or see a bigger picture. Brenda has the most beautifully simple way to handle such things. With the calm and wisdom befitting a Buddhist monk she faces a constant stream of all nature of events and people with their own share of issues, many of whom turn their issues against the staff or Brenda herself. She deals with such matters that would annoy, upset or enrage other people, in the most admirable way. “Compassion” she says with a zen like smile. For me, if things get too much, I try to make something different happen…. Remove myself from the rut and go somewhere out of the ordinary, or where I can be reminded that life is not all about stress and hardship or people and their issues, but simply LIFE. 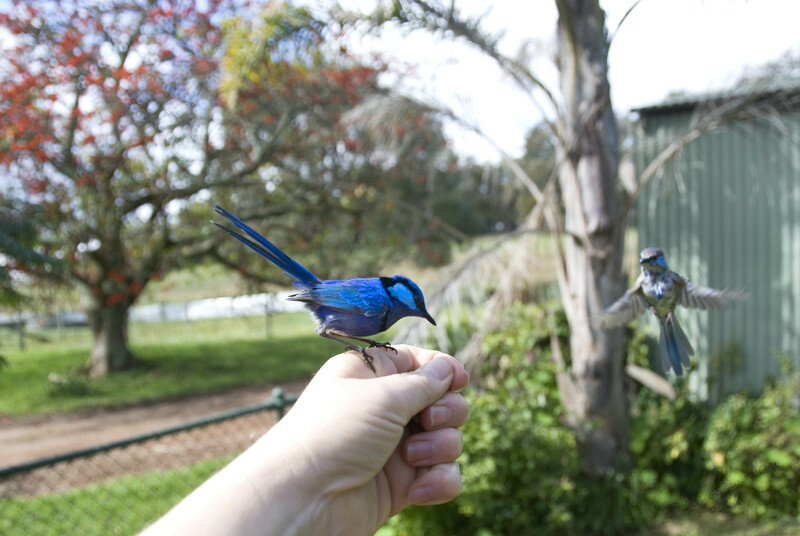 Last week, I took such a drive down to Margaret River to Eagles Heritage, to meet up with a little friend of mine. 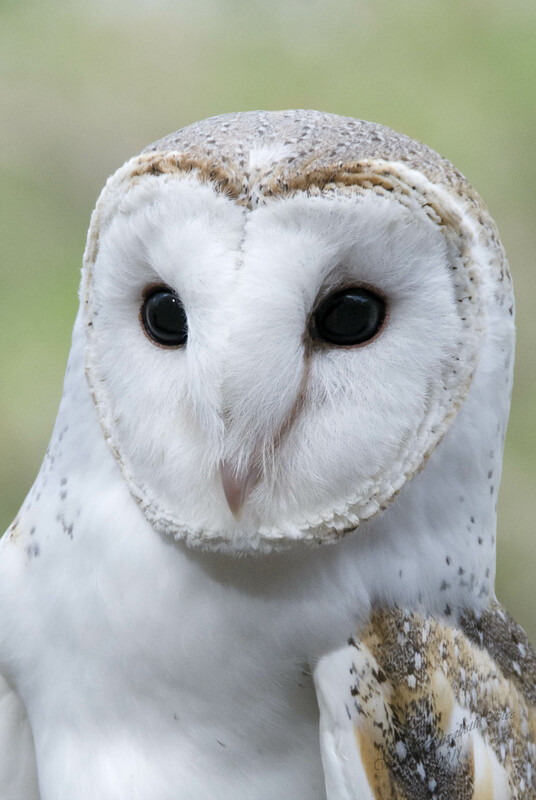 Echo the Barn Owl is, as the name suggests, a Barn Owl, and the most quaint and lovely little fellow you could ever hope to meet. He and his carer/handler Nancy were doing the free flight display and talk at Eagles Heritage, and as I have photographed Echo many times over the past few years, I thought I would visit the raptor sanctuary and catch up with them both again. I always enjoy being out in nature and seeing wildlife, and even though many of the raptors at Eagles Heritage are in cages, they are only there for a reason. They have either been rescued after illness or injury, in which case they are cared for and then carefully released back into the wild, or if their injuries would place their lives at risk if released, they are cared for indefinitely. 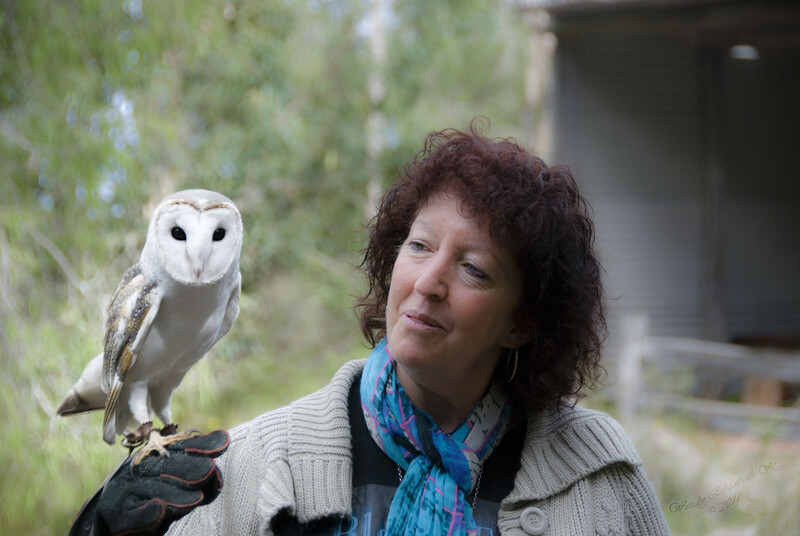 In some cases, where they become accustomed to handling and human presence, they can become ambassadors and education birds, used to promote the care, preservation and wellbeing of not just raptors but all wildlife. Any birds that spend the whole of their lives in cages are only there because to be free would spell certain death for them. Judging by the stories of, and the actual birds themselves, that return once released, to visit, show off babies or mates, or cadge a free feed during a flight display, they do appreciate their caregivers and their lives in proximity to humans, and certainly do not forget. 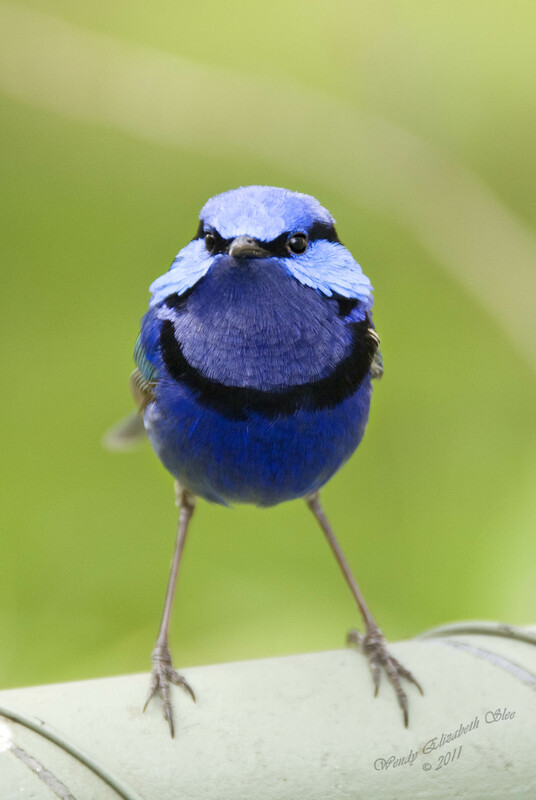 Some birds have been born in captivity, from parents who live at the park or at one of the other raptor centres or zoos aroundAustralia. 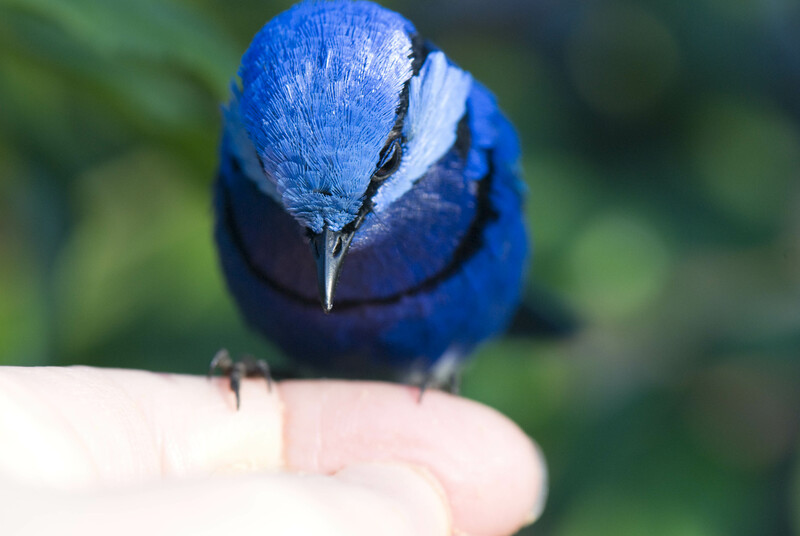 Birds bred in captivity are supposedly not allowed to be released back into the wild, for environmental and health reasons. 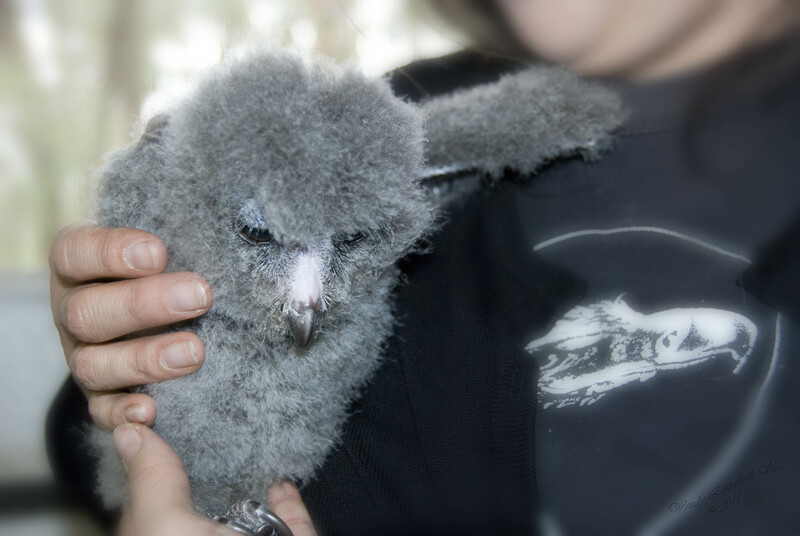 During my visit I got to meet one such baby – a lesser sooty owlet. 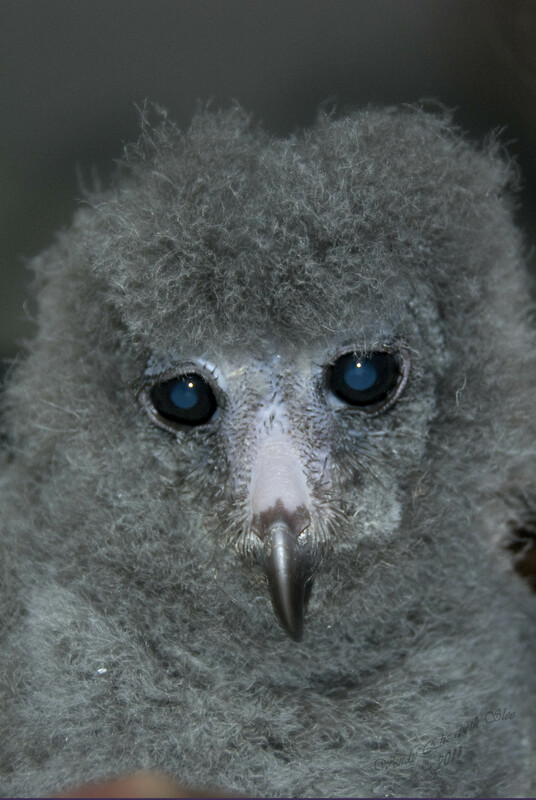 As yet unnamed, this tiny, fluffy baby was hatched from an egg produced by the two lesser sooty owls at the raptor park, and was being raised by humans. All eyes and beak, he was almost grotesque, looking more like a little vulture than an owl, yet like the ugly duckling, it would only be a matter of time before he was a magnificent bird, though an owl not a swan. Speaking of magnificent, I also got to see one of the baby owl’s older siblings from a previous hatching – a female lesser sooty called Chip. She was the most exquisite bird – with pure white plumage. She put on a display of aggression towards me as I looked into her enclosure, and it seemed as if she was afraid, so I backed away feeling rather sad for disturbing her. However I was told by her carer that she was not at all bothered by humans, as she had been hand-reared, and was perfectly friendly – her only issue was that she was annoyed at being transferred to the raptor park enclosure after a life in a human household and had become a grumpy bum! Echo was his usual charismatic self, sitting up proudly for the free flight talk, allowing people to photograph him, or hold him on a gloved arm, all the while looking around with great interest, or staring rather intently at the speaker box over our heads, and attempting to fly at it. (It turns out that the box was emitting a humming sound that we could not detect, but he could.) Many times during the talk he directed his gaze intensely at the roof above our heads and made as if to attack. It gave me a bit of an idea of how it might feel to be a mouse on the ground with an owl scouting above. The intensity of the eyes in the seconds before he took flight was something to see! I always enjoy meeting the people and birds at Eagles Heritage. 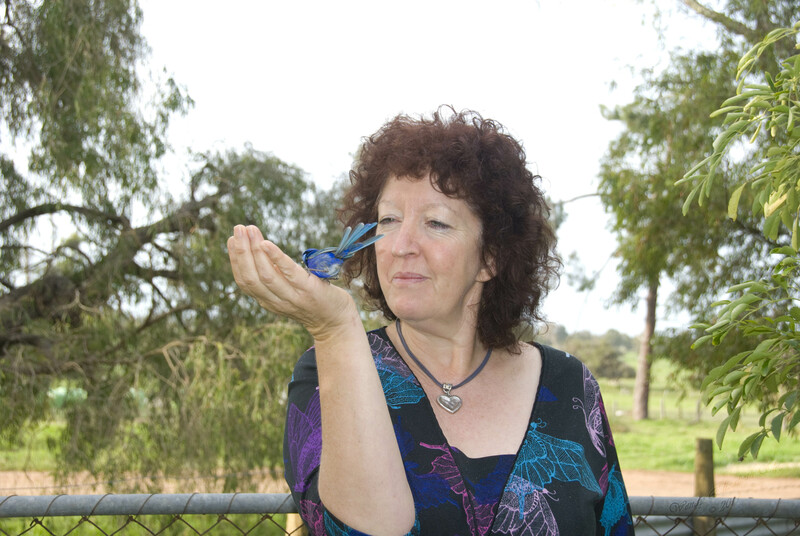 Immersing myself in a place that honours and cares for wildlife, and our magnificent Australian raptors, where people are doing good rather than harm and endeavoring to make a difference on this planet, is one of the uplifting and interesting things I can do to turn a bad day into a good one! So what do you do at times like this?